Aren’t these beautiful? My friend, Jane, made the top one and mine is on the bottom. This is a pattern by my friend Anjeanette. 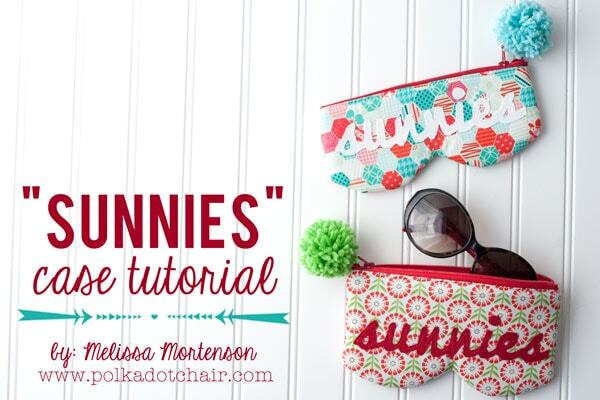 You can find the tutorial on her blog here. I have been in love with this since Anjeanette showed it to me last fall. 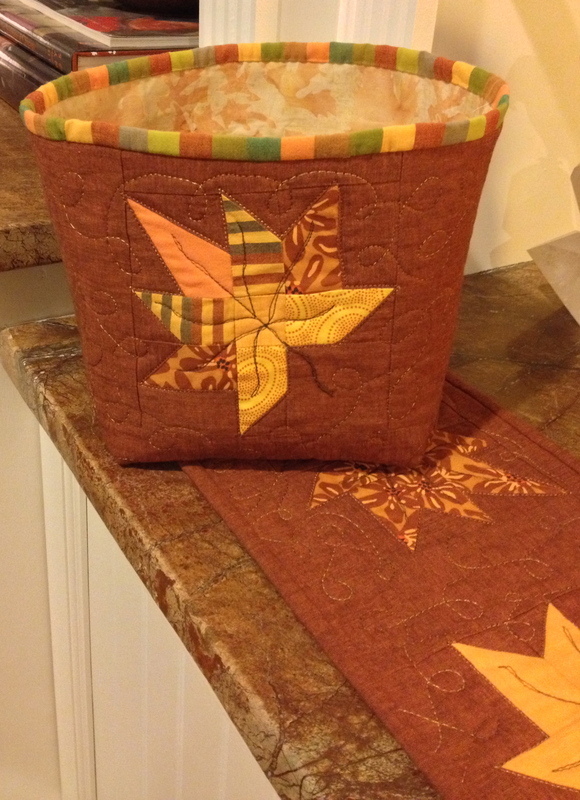 This fall she offered a class on it at our local quilt store Capital Quilts and I could not resist. Jane was going to be visiting me from out of town at the time of the class. I sent her a picture of Anjeanette’s table runner and asked her if she wanted to come. Jane couldn’t resist it either! The leaves can be easily cut from a charm pack. 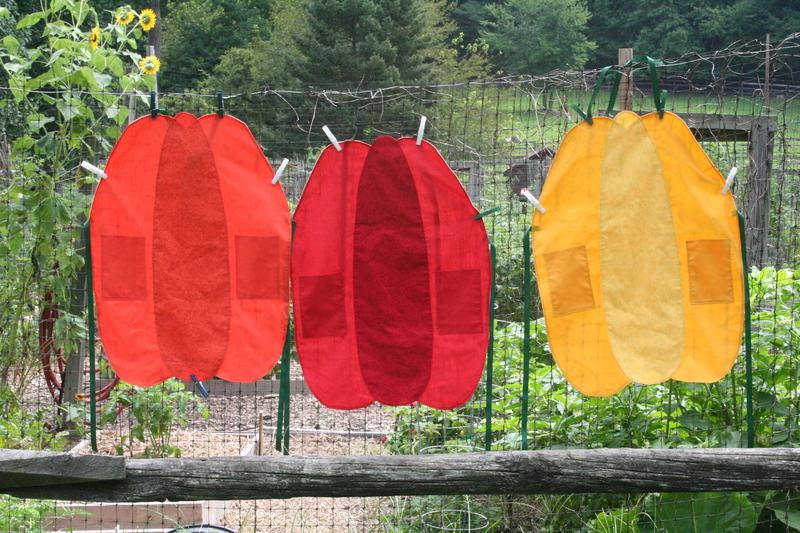 Jane used a charm pack of batiks and I bought some fat quarters of Kaffe Fassett fabrics in fall colors. 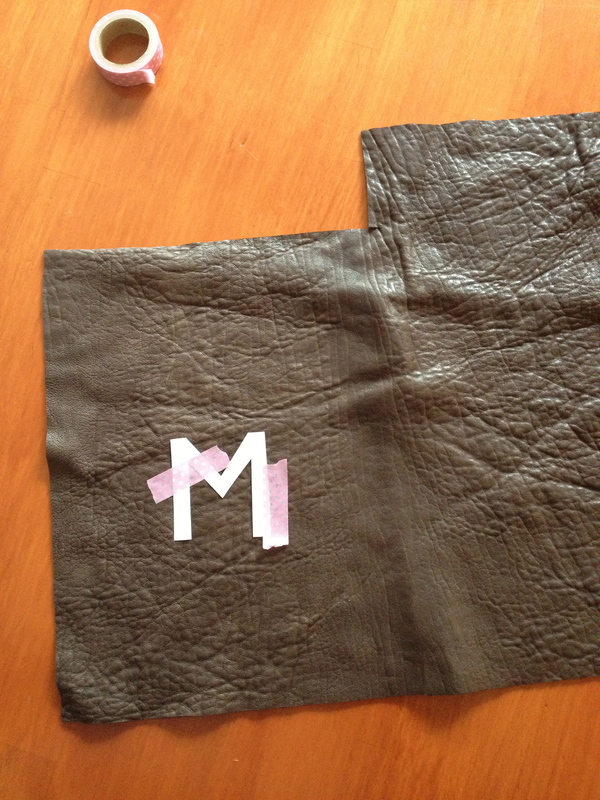 Anjeanette went over a lot of little details during class about piecing that helped us to get an accurate result. 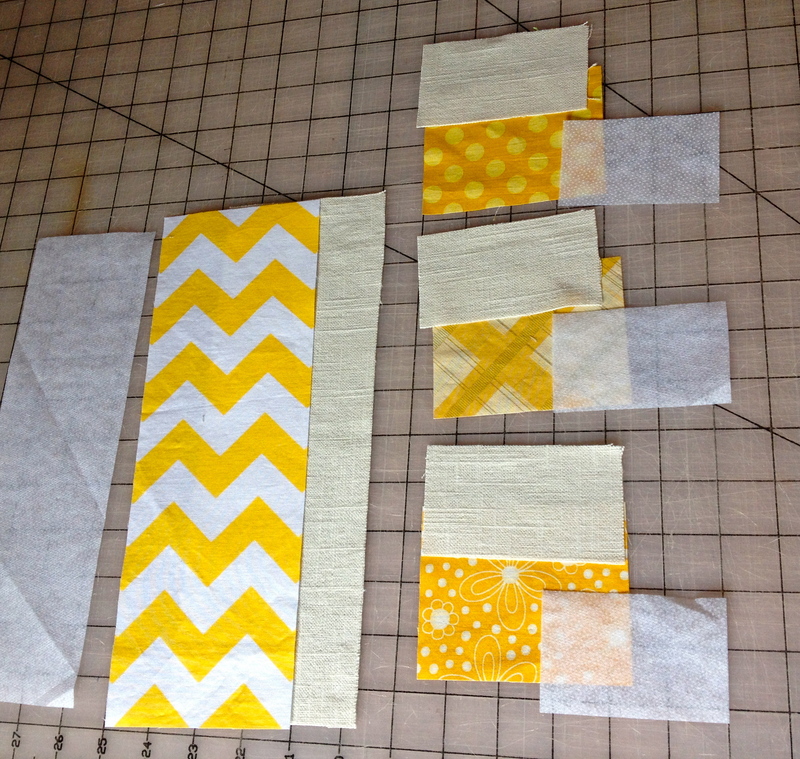 These blocks, without sashing are about 5-1/2″ square. The pieces are small. 1. Use a 1/4″ foot if you have one. 2. 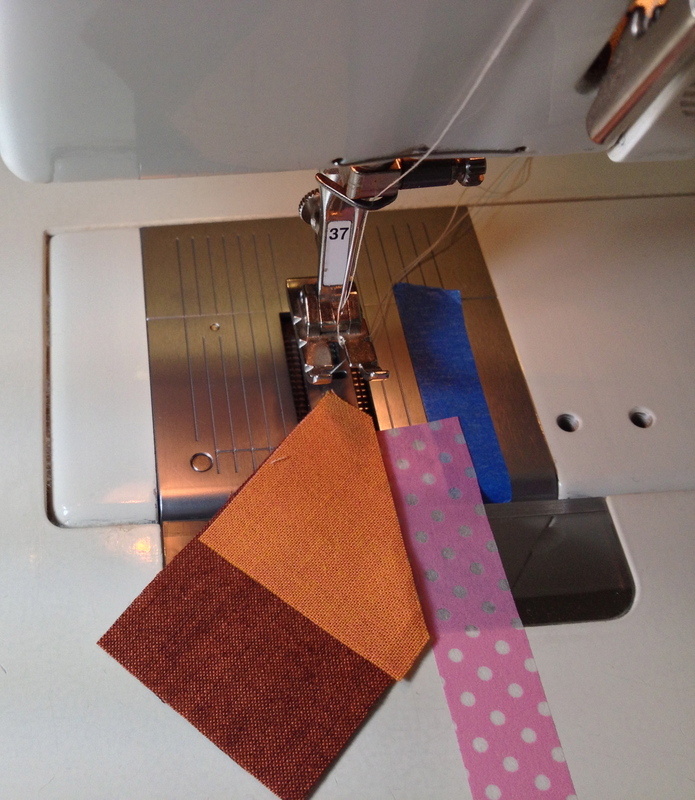 Line up a piece of colored tape to extend the 1/4″ mark forward on your sewing table so you have a much longer guide to sew against. 3. Hold the piece you are sewing all the way through the presser foot. Don’t let go right at the end. If you have to use a tool to guide it under the foot, do so. 4. 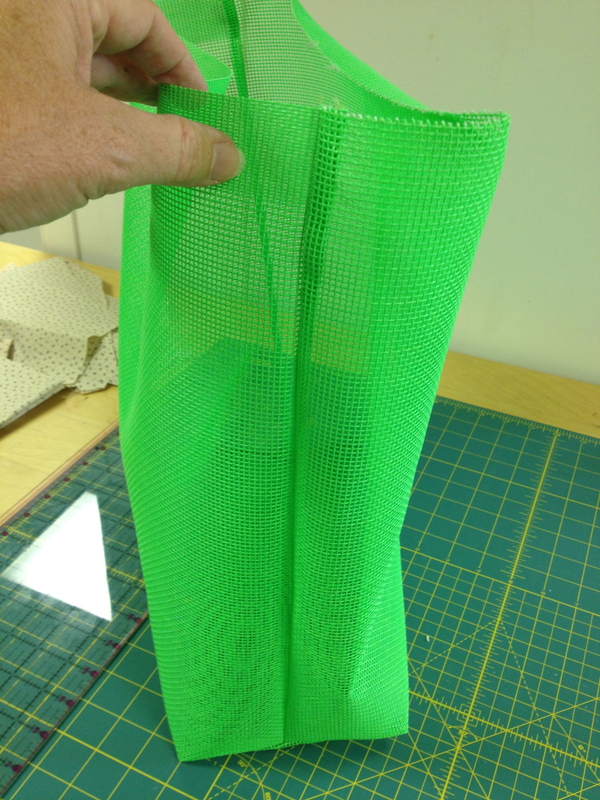 Use a scrap piece of fabric as a leader before sewing your little pieces. This will keep the threads from being sucked down into the machine. 5. 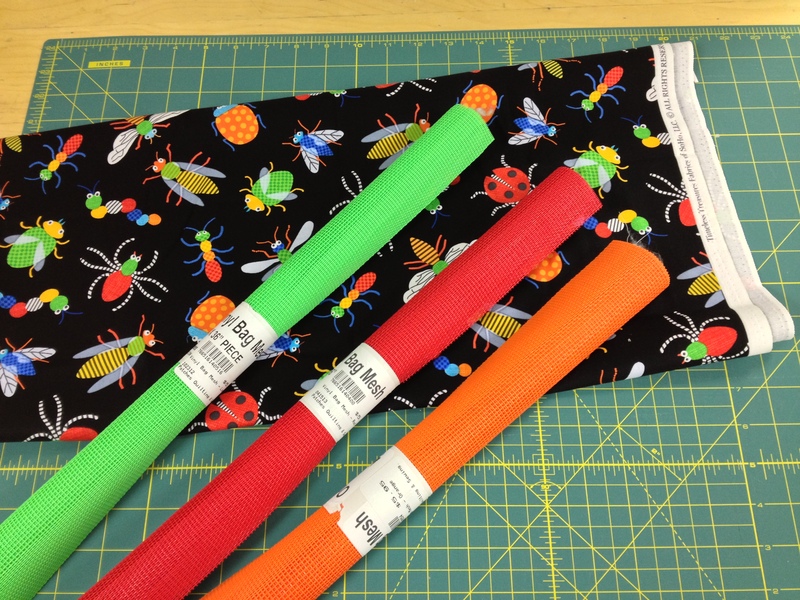 Each fabric piece usually has a little stretch in one direction. 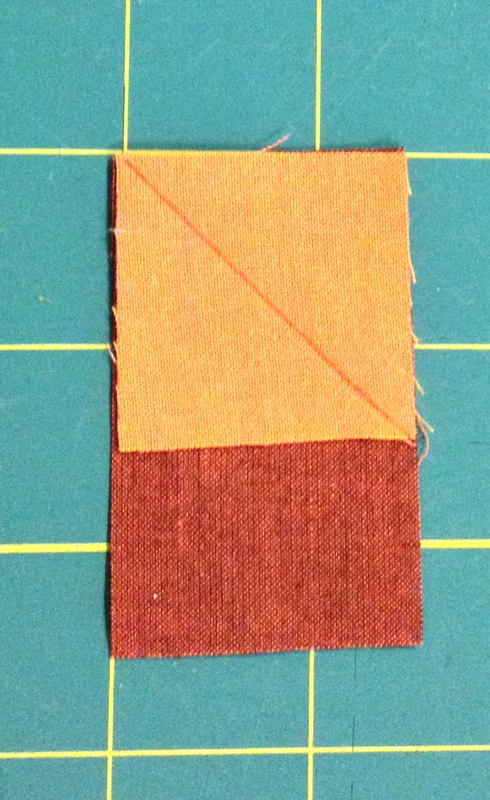 If you determine this ahead of time, you can often position it in such a way that the non-stretchy edge ends up on the edge instead of along the sewn line. 7. Ironing – Set the pieces by pressing them flat first. 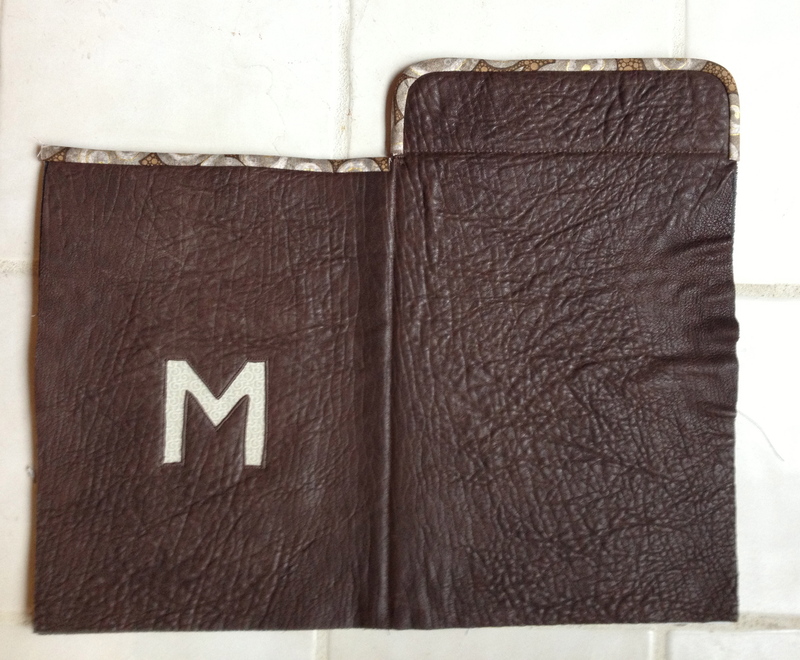 Then open up the seam and press. Don’t use steam. 8. 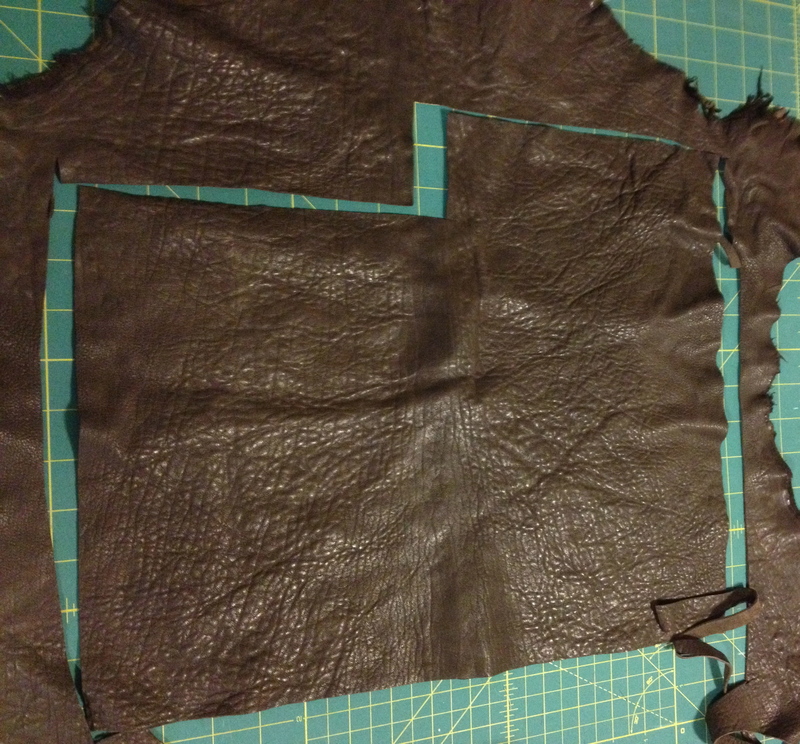 Anytime you can make your pieces a little larger, sew them together, and then cut them into the exact size you need, the easier it will be to get them perfectly square. 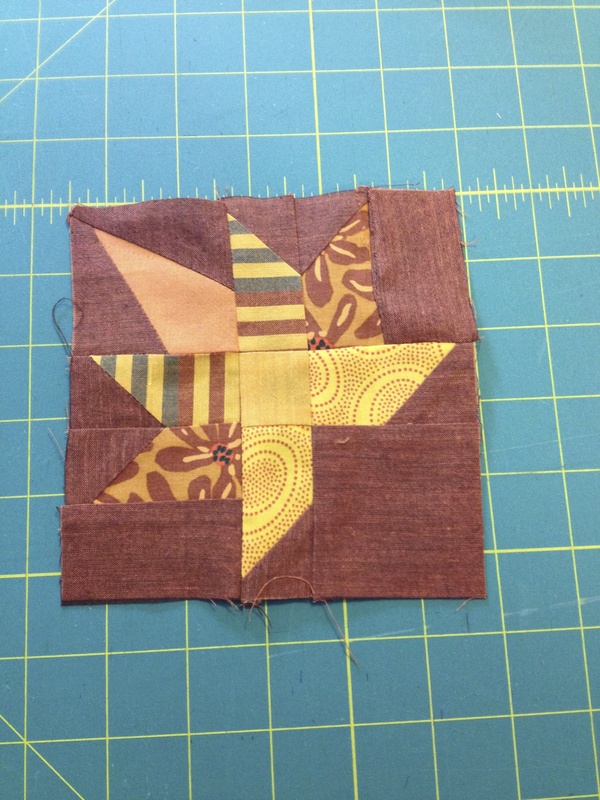 This was the case for the kite shape that is in this block. 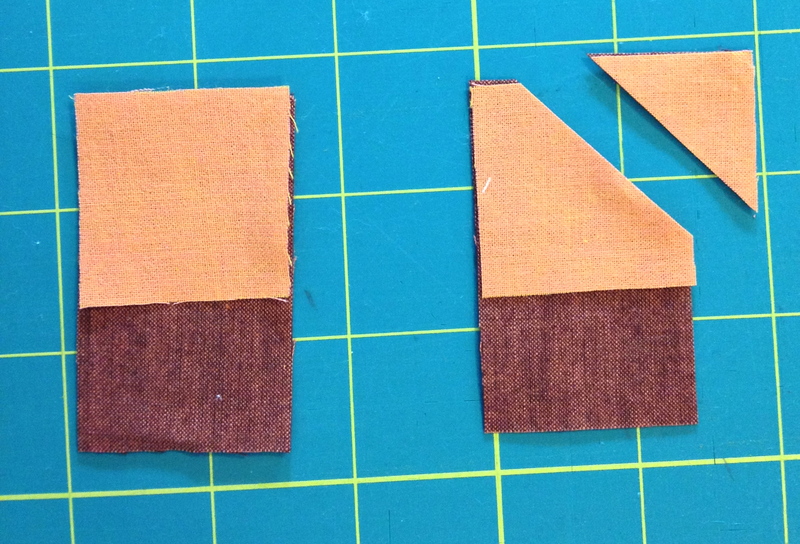 It begins with a rectangle, a square and the need to sew a diagonal line. 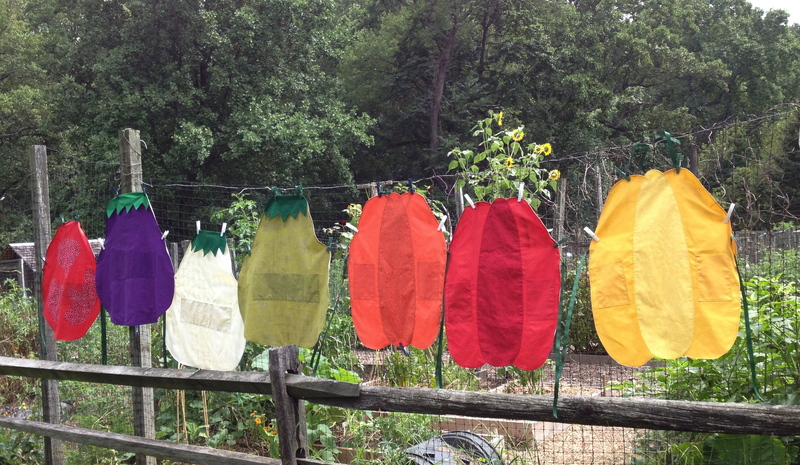 You could mark each of these and sew on the line and then trim. 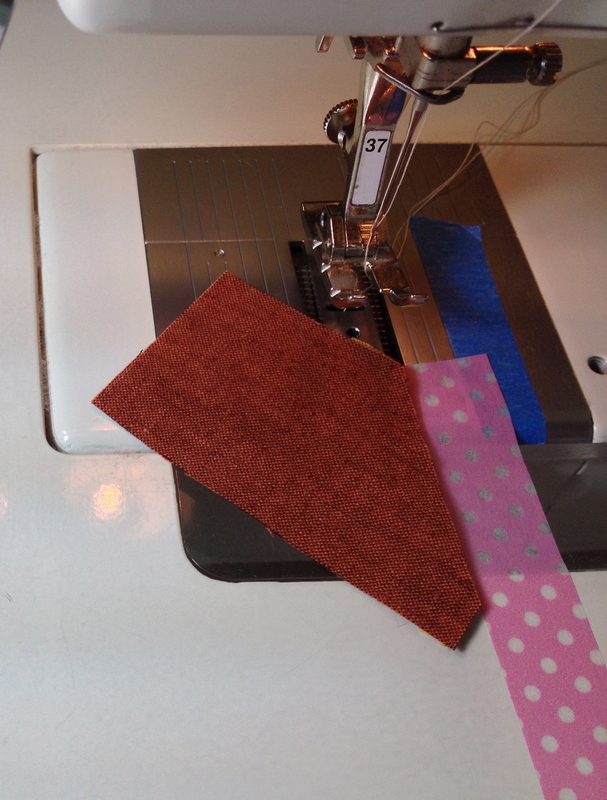 Don’t mark, trim first, then sew. 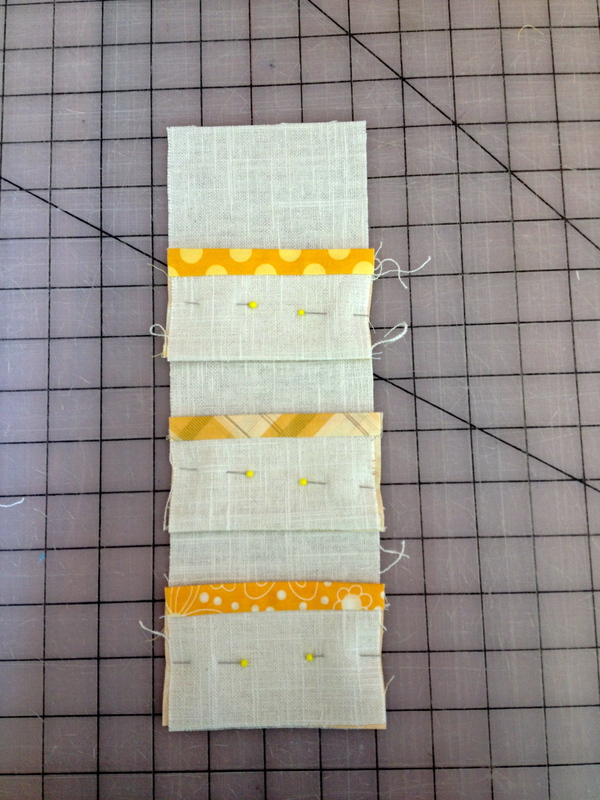 Line the 1/4″ mark of your ruler on that diagonal and then trim the excess away. 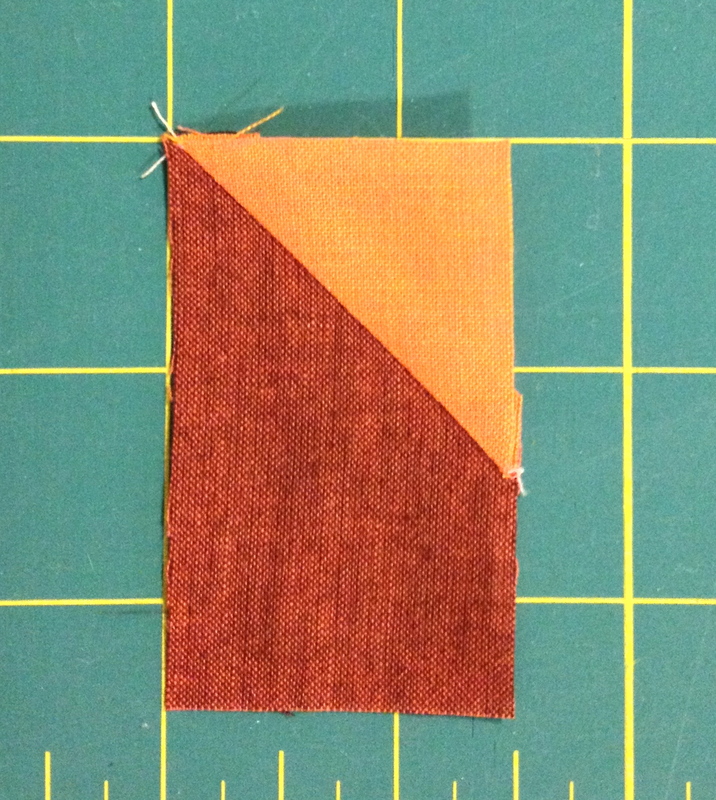 This way you are ready to sew using the edge of the piece as a guide. 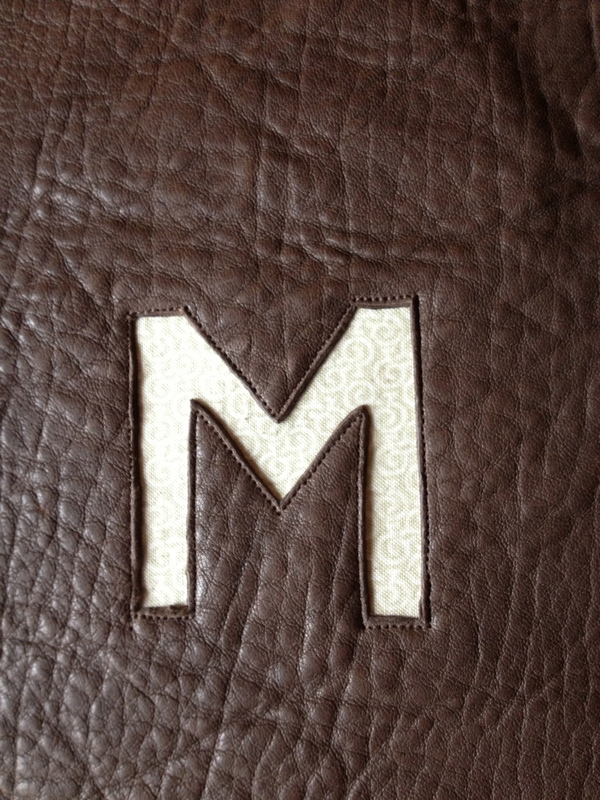 Here are pictures to illustrate tip #6 above regarding how to stitch this piece. Point first! Don’t do this. That point is sure to get caught up if you try to sew it like this. Flip it over and sew this way so that the point goes through last. I promise that the orange piece is lined up nicely under there and sewing it this way will give you a much better result. 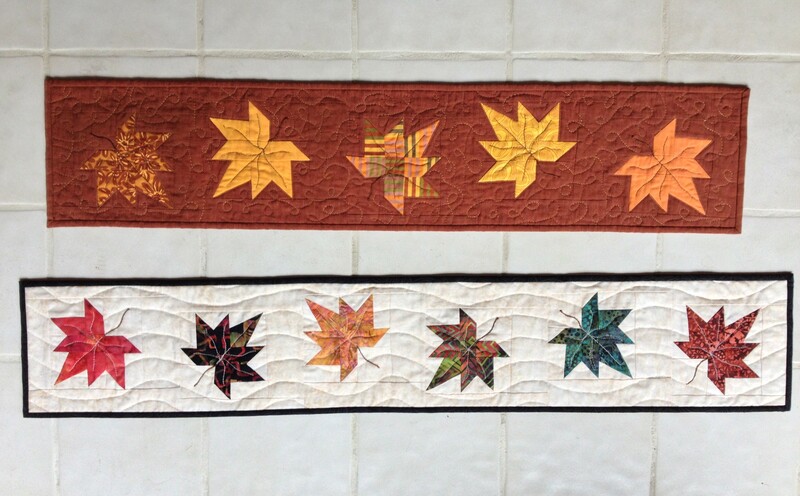 Once the leaves are pieced, they are bordered with sashing in different widths. I think this is what makes this table runner so special. It has movement to it because the leaves are not all lined up in a row and facing the same direction. 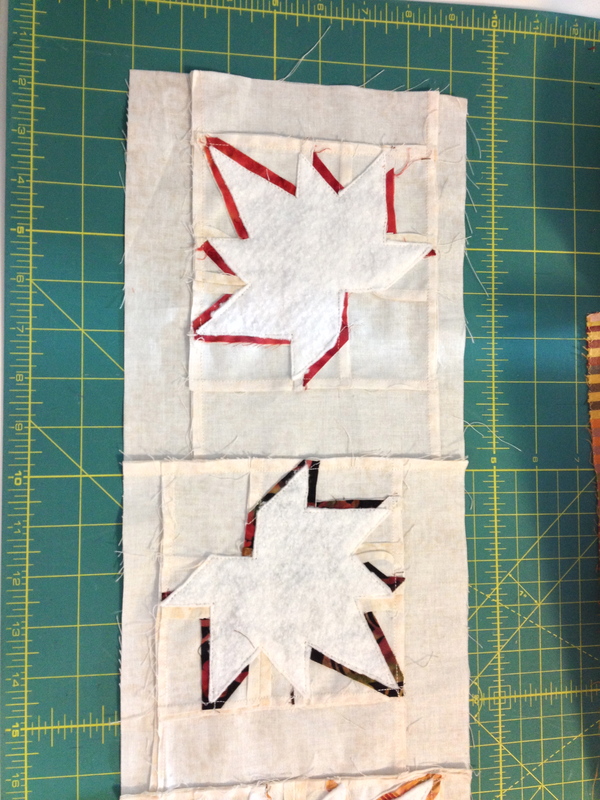 When sewing on the sashing, always have the pieced block facing towards you so that you can see that you are sewing to the right of the leaf tips and not cutting them off. 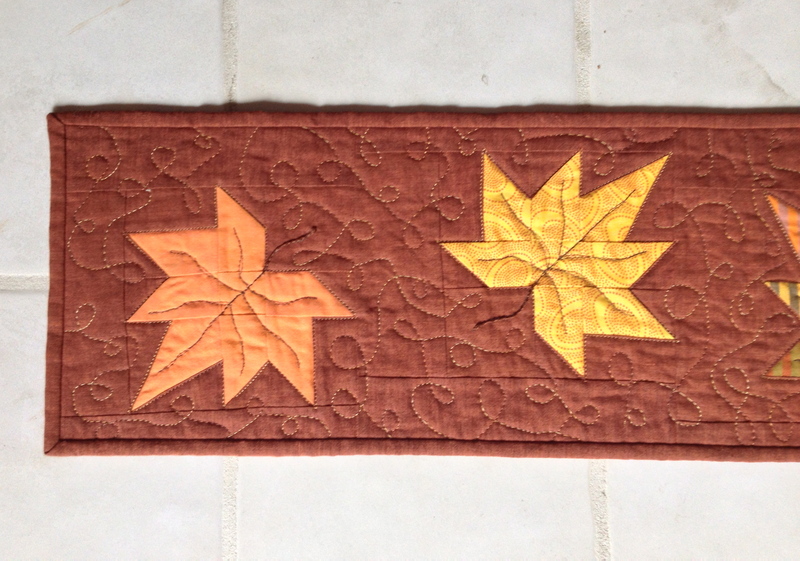 Jane’s table runner has an extra layer of batting under the leaves in order to make them stand out a bit more. Batting sewn and then trimmed away from back of leaf. Once this was done, a layer of batting was applied to the whole runner top and veins were free motion quilted on the leaves and then a stem was embroidered on. 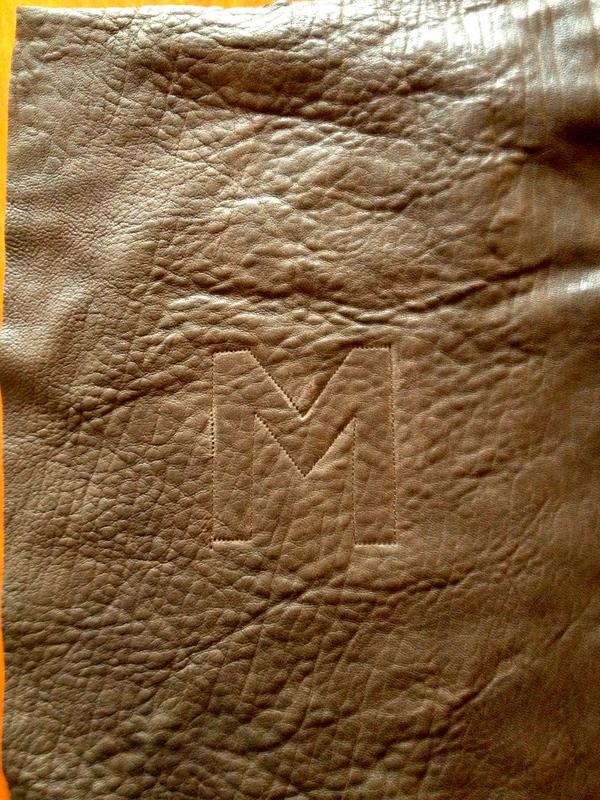 This was done before the backing was put on so that this stitching would not show on the back. 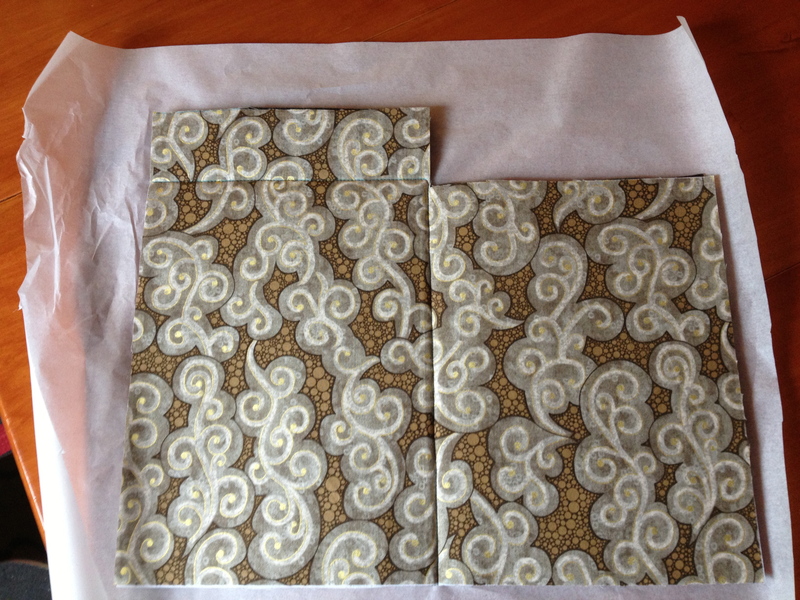 Now the backing was added and the piece was quilted and then the binding put on. I love the way that Jane’s (the light colored one) is framed by the dark binding and mine was bound in the background fabric so that the leaves are the whole show. This is such a good example of how the same pattern can look totally different. Please look closely at those points. We are so proud of them! Again, you can find Anjeanette’s tutorial for this table runner here and the homepage to her blog here. You may just want to go there to look and see what she’s up to now. 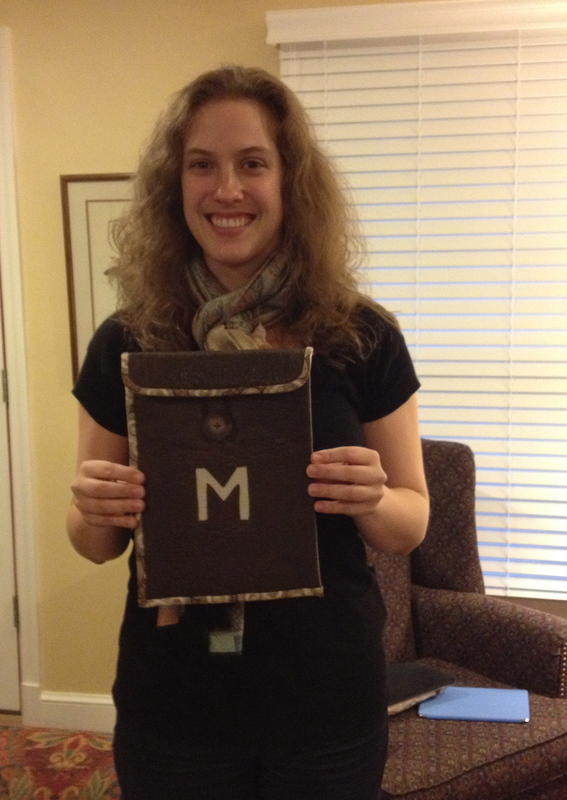 This isn’t the only beautiful project that she has designed! 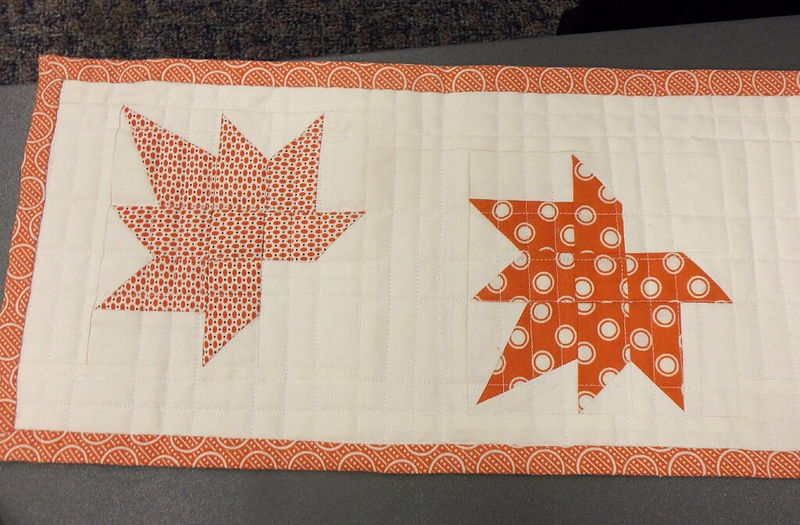 Addendum: Moda Bake Shop has just posted a throw size quilt by Anjeanette using the same leaf block but double the size! Find it here. “Hanging out” in the garden! 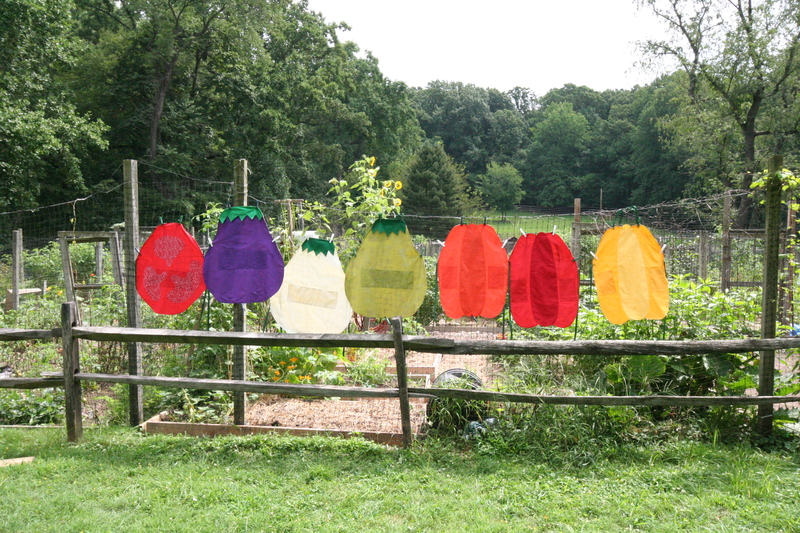 These are vegetable aprons that I was commissioned to make hanging up on the fence of my local community garden. This is actually my plot within that garden. It is located in Rock Creek Park right here in Washington DC and has been the source of lots of good things to eat this summer. 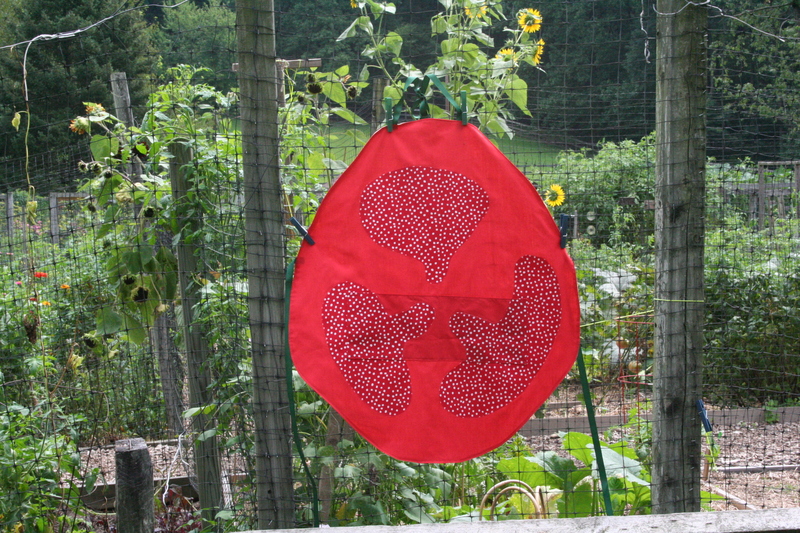 I was contacted through my blog by someone who had seen the bell pepper hot pad I had made as part of the Patchwork Please sew along. 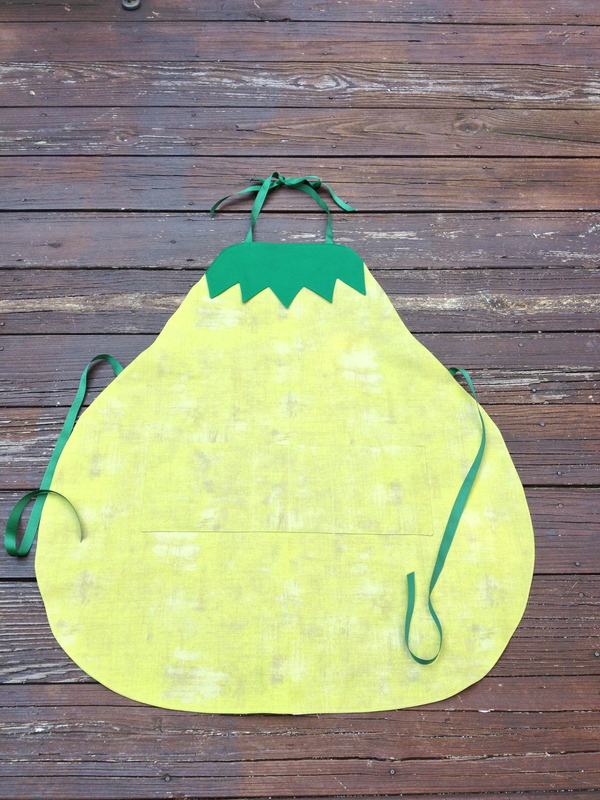 They asked me if I could make something similar to this into an apron. 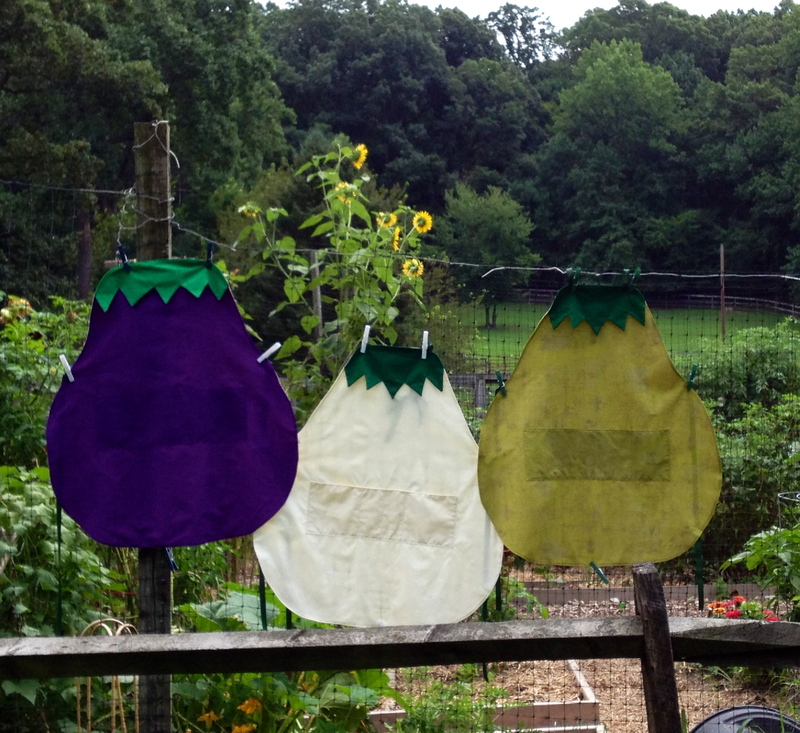 They wanted 3 different colored bell peppers and 3 different colored eggplants. 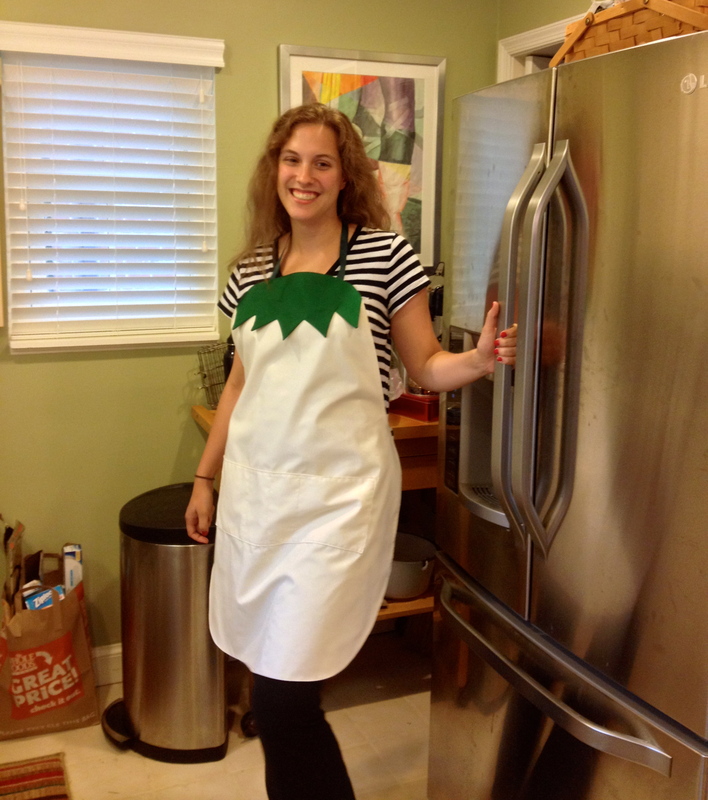 My daughter wearing the white eggplant apron. They also wanted a tomato. I thought I was pretty clever making the “seeded” sections travel across the pocket of the tomato. 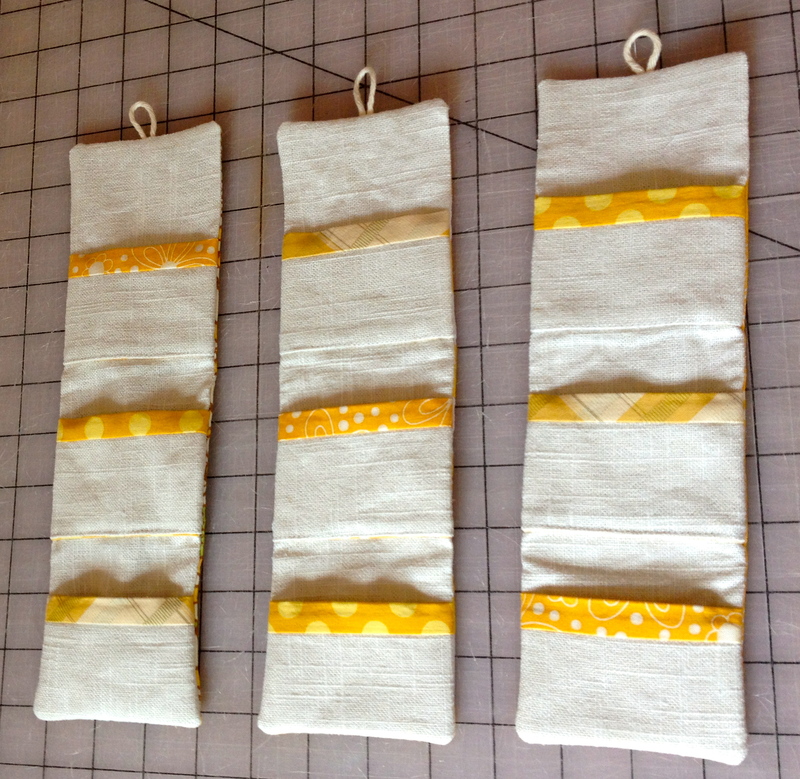 The aprons all have grosgrain ribbon ties at the neck and for around the waist. 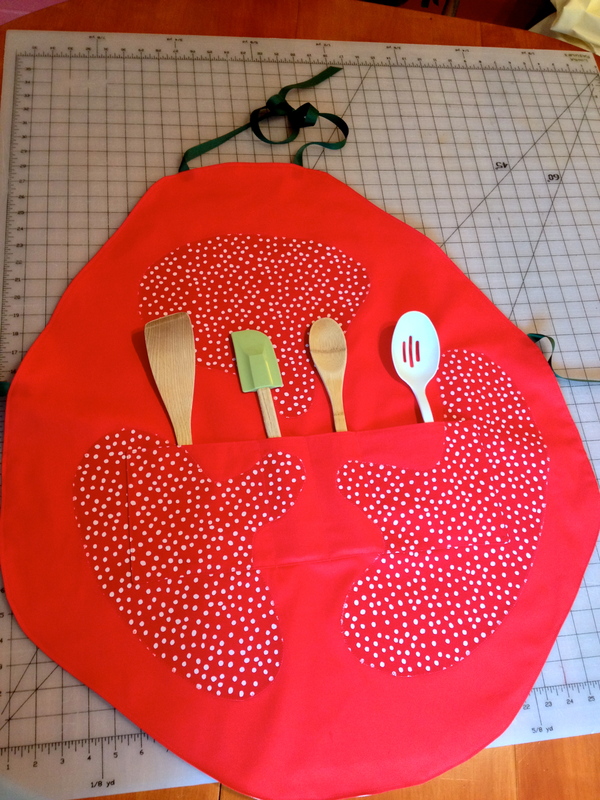 It was a ton of fun to make these aprons! 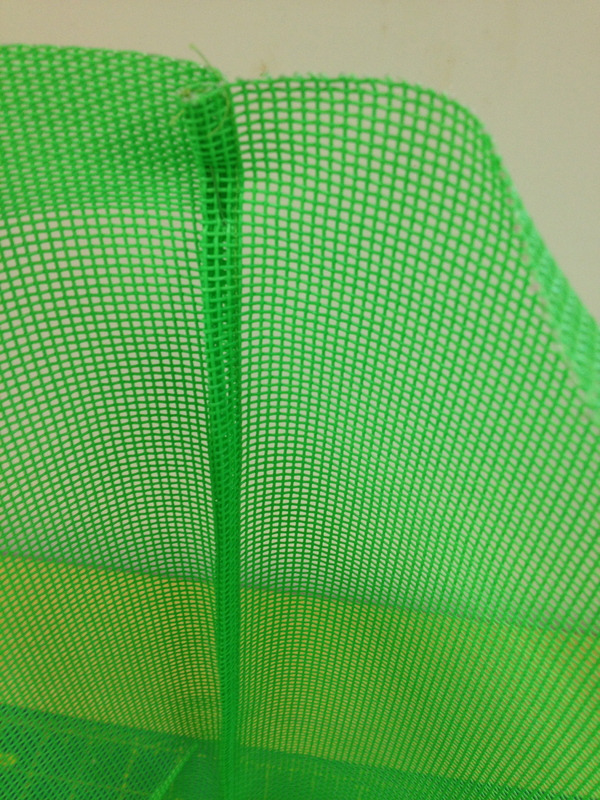 Solid fabrics were requested. 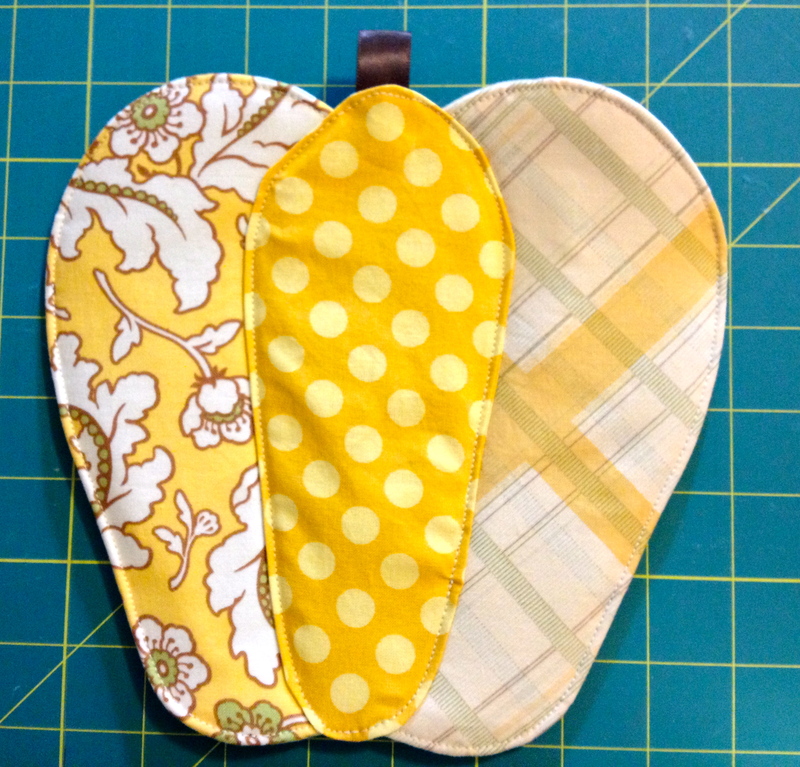 I think it would have been even more fun to sew them in more interesting fabrics (like the hot pad). I was sad to send them off. Maybe I’ll be making some more soon for myself, just for fun! They sure looked cheerful on that garden fence. The Fourth of July is a fun holiday for me. 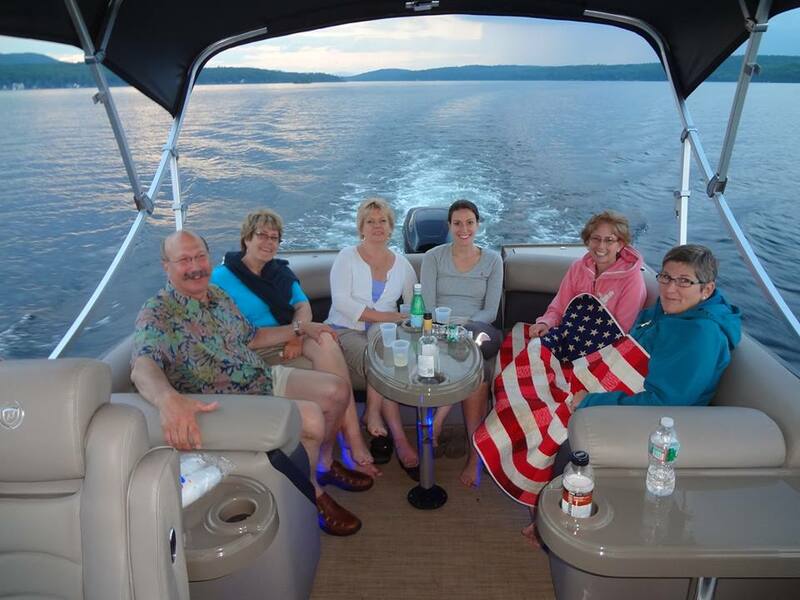 I spend it in NH on Lake Winnisquam with my brother and sister and as many of our kids as can come. 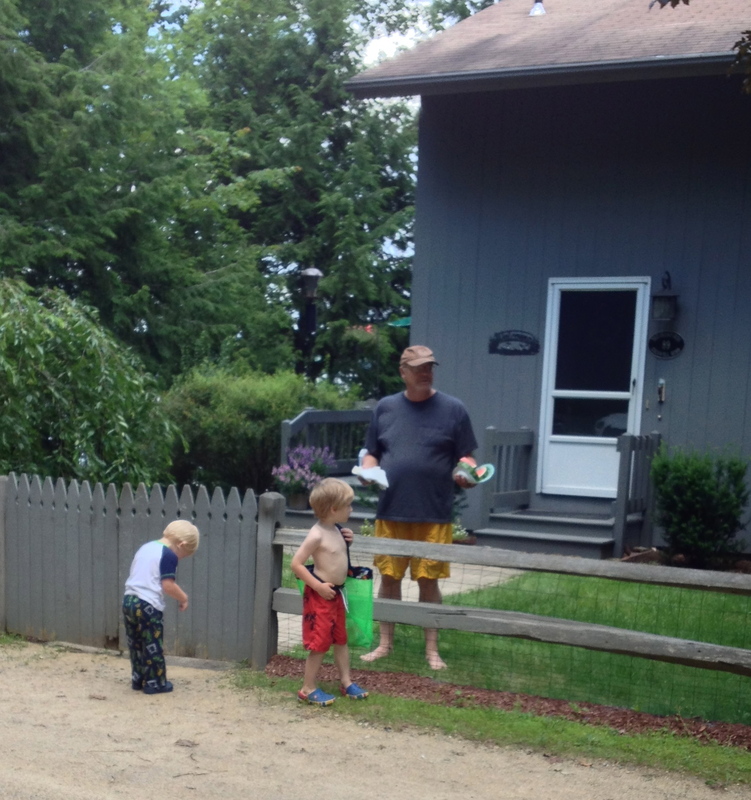 My brother has 3 grandsons that live nearby and they definitely add to the fun and excitement. This year about 2 weeks prior to traveling I was on a road trip (by bus) with the Needlechasers of Chevy Chase to a quilt shop called Patches in Mt. Airy, MD. 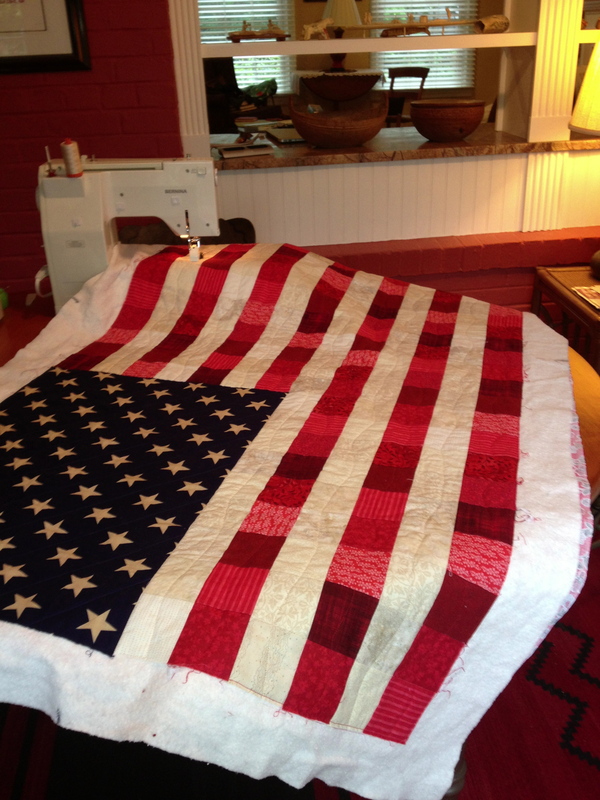 There was a quilt laying near the cutting table that was essentially a flag. 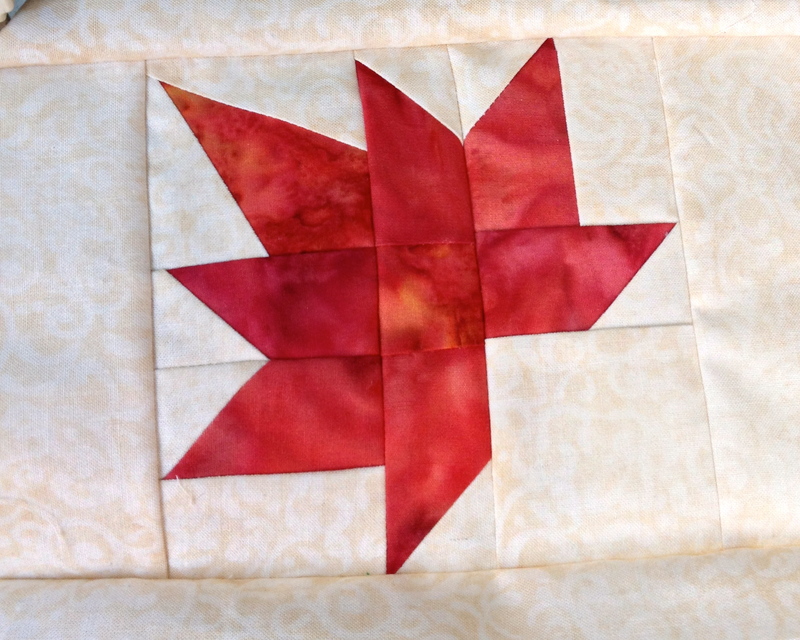 I really loved how it was pieced together in different shades of red and white and had a star fabric for the blue canton. I immediately wanted to make one and figured, as I often do, how easy it would be to make up fast! 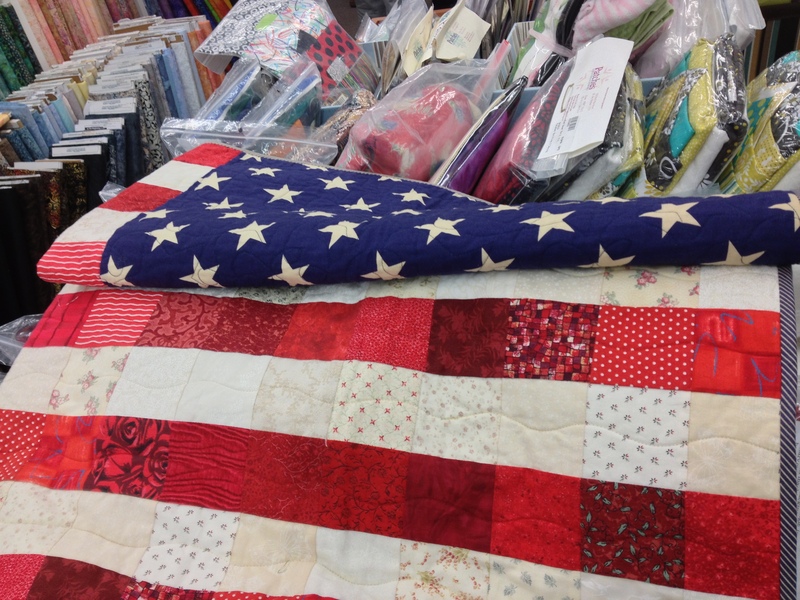 So despite the fact that the store staff was busy cutting fabric for our 40 or so members on the trip, I was able to ask if they had the star fabric, and luckily they did. 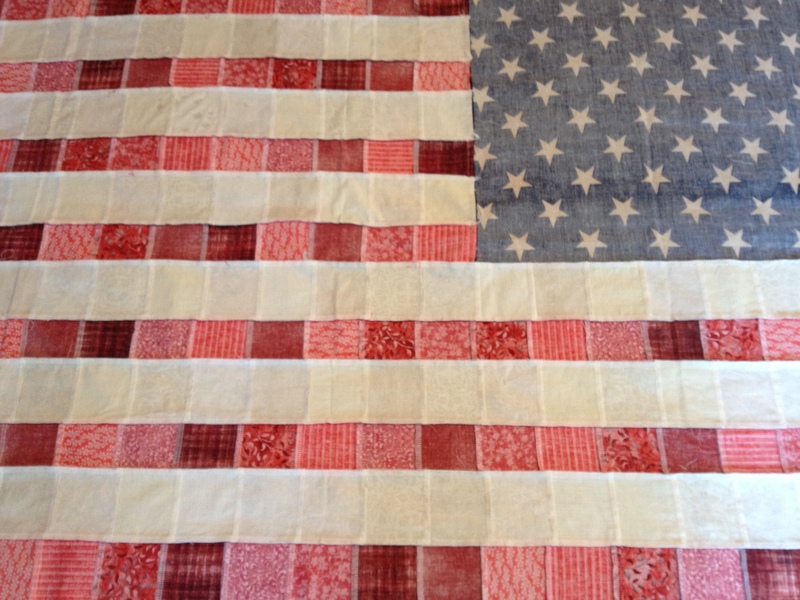 I took this picture of their quilt because I liked the easy wavy quilting that was done on it. (Are you catching on to what was important to me?) 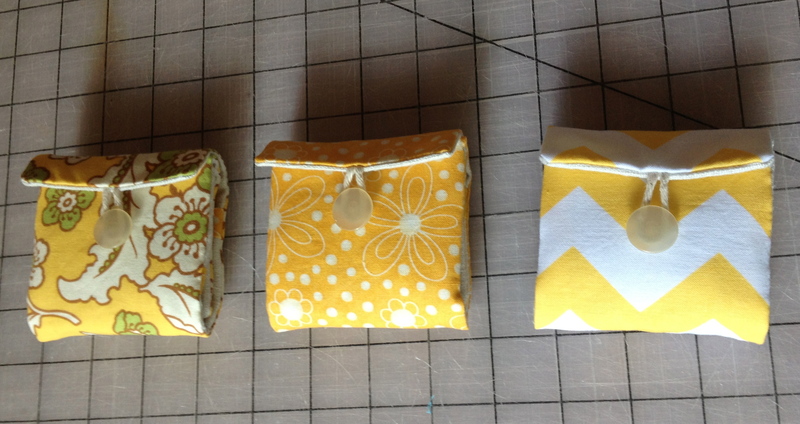 I chose fat quarters and took them home, washed them and cut them into 3″ squares. 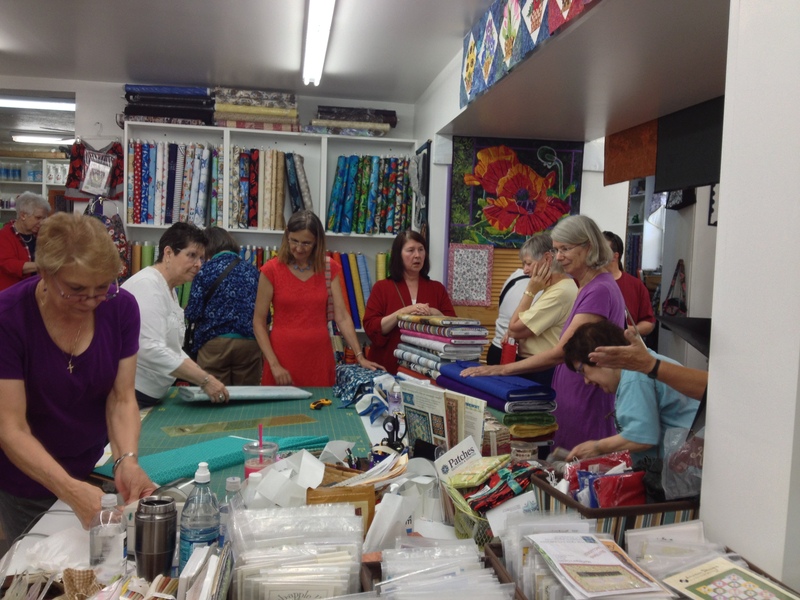 On the following weekend, the DC Modern Quilt Guild had a sewing retreat for 3 days. I had a serger there for a different project and decided it might be quicker to use that to sew all these squares together. Since completing it, I’m really not sure that it made ANY difference at all in the time it took, but I did love how tidy the back was when I was done. I got the quilt top done at the retreat but didn’t have any backing fabric so the final backing, quilting and binding was done at home. Working on the wavy quilting. 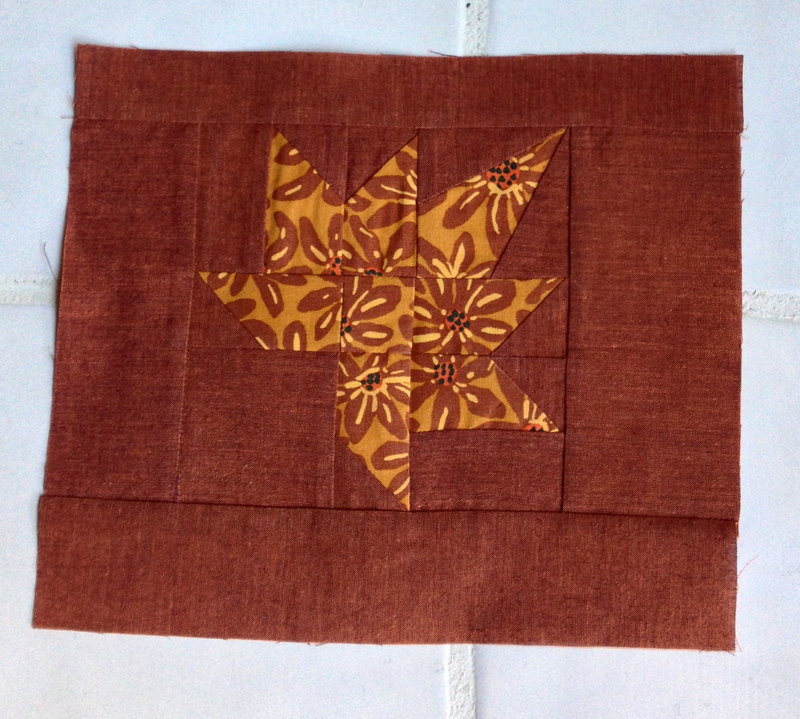 Quilting this way with a walking foot was very easy. I used matching thread and did a wavy line on each of the red and white stripes. 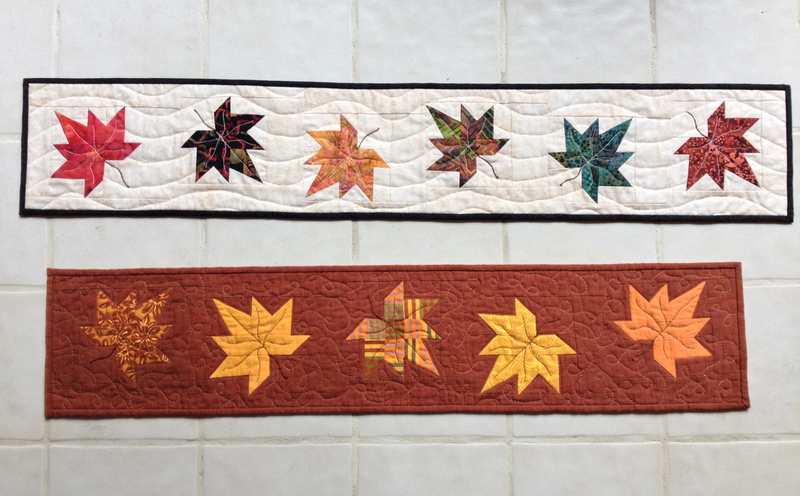 I did a diagonal straight line through the star fabric. 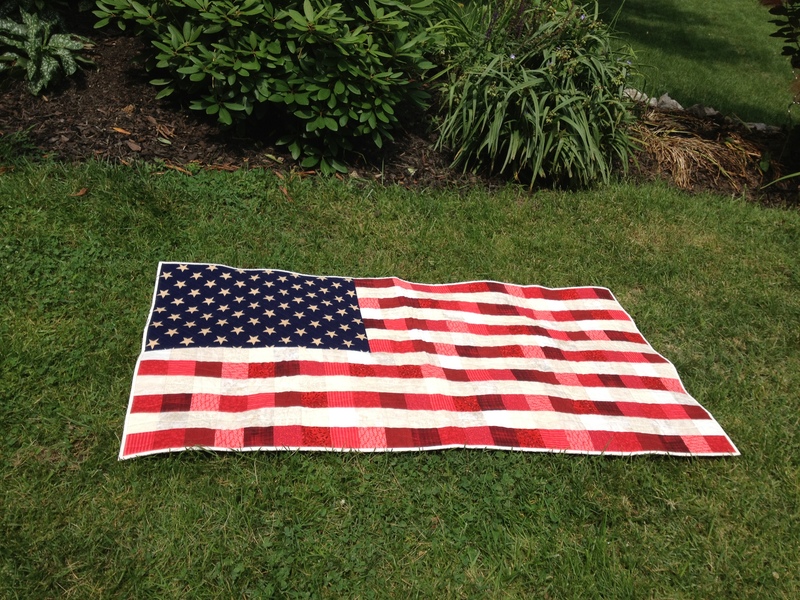 I originally thought that this quilt would be a table topper but the size may be a little awkward for that. I think that we will display it off the deck as though it were a flag. Surely no one will get close enough to count the stars. 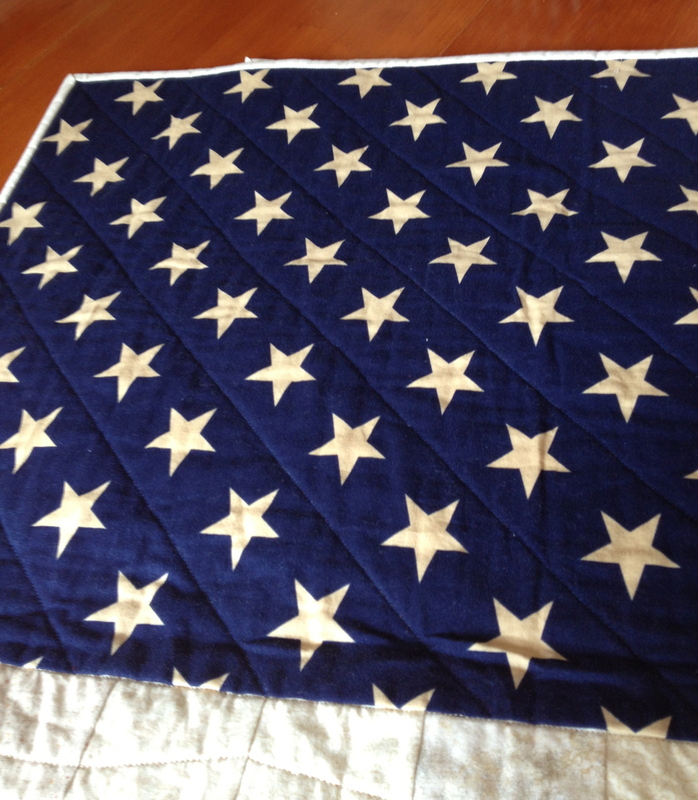 Although the size of the stars look about right for the size of the flag, there are actually 70 stars! 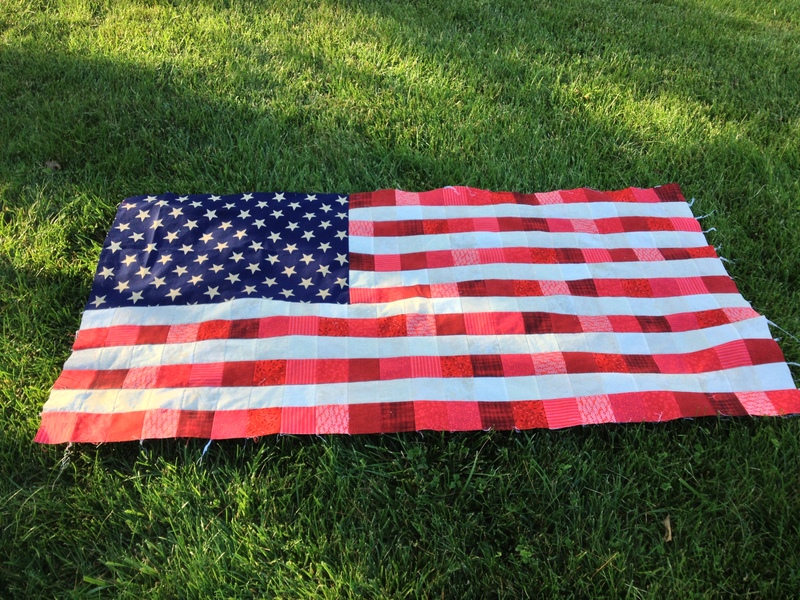 I gave the flag quilt to my brother and sister-in-law while cruising Lake Winnisquam in a pontoon (party!) boat from Winnisquam Marine which my brother owns and operates. It turns out that it’s actually a pretty good quilt for keeping warm. 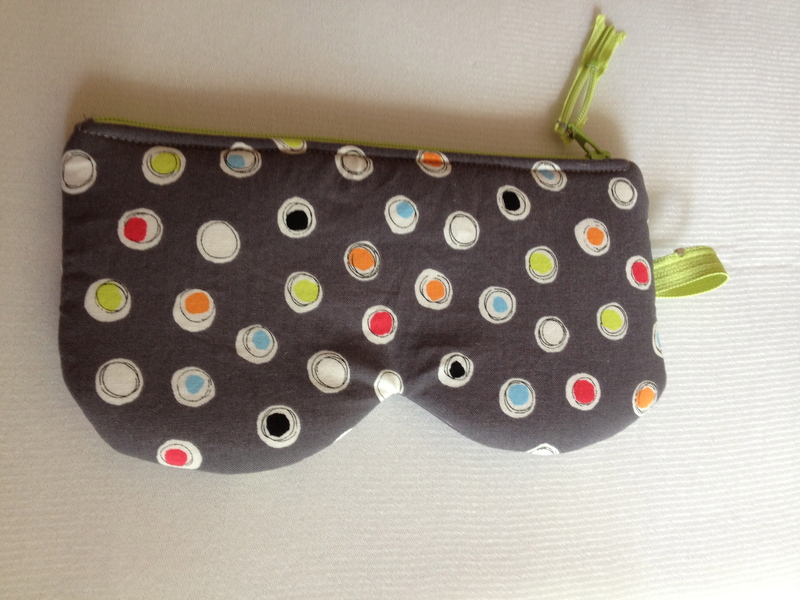 This week the Zakka 2.0 sew along has us sewing a tea cozy and/or teabag pouch. I thought long and hard about making the cozy because I do have a small 2 cup ceramic teapot that I could use a cozy for, but in the end I decided to make only the pouch. 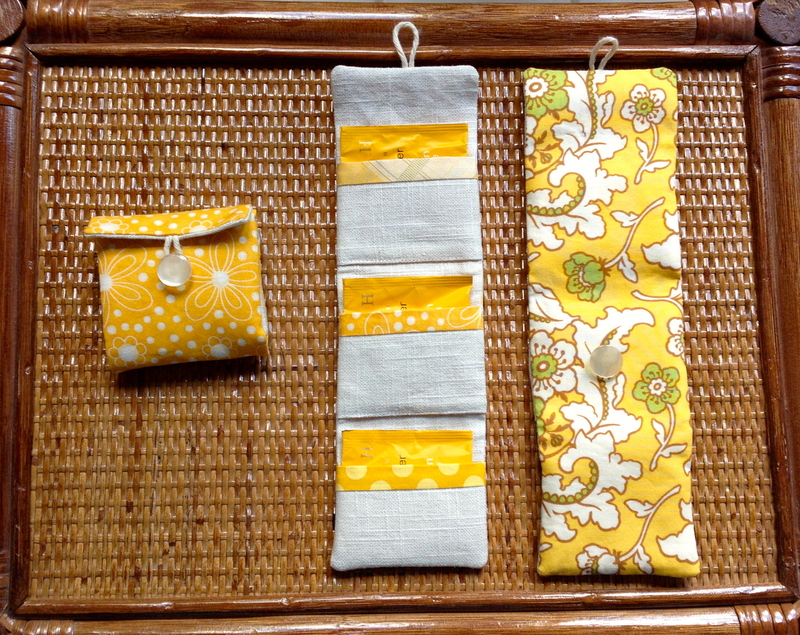 My 3 daughters all drink tea and I thought a pouch would be handy for them to take their favorite tea to work or keep in their purse – so I made 3. 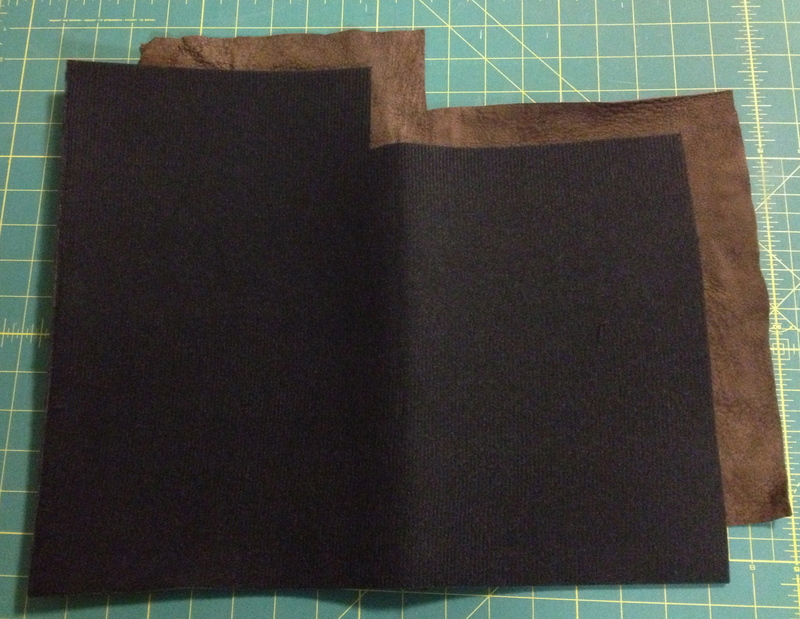 Here are the materials all cut for one pouch. 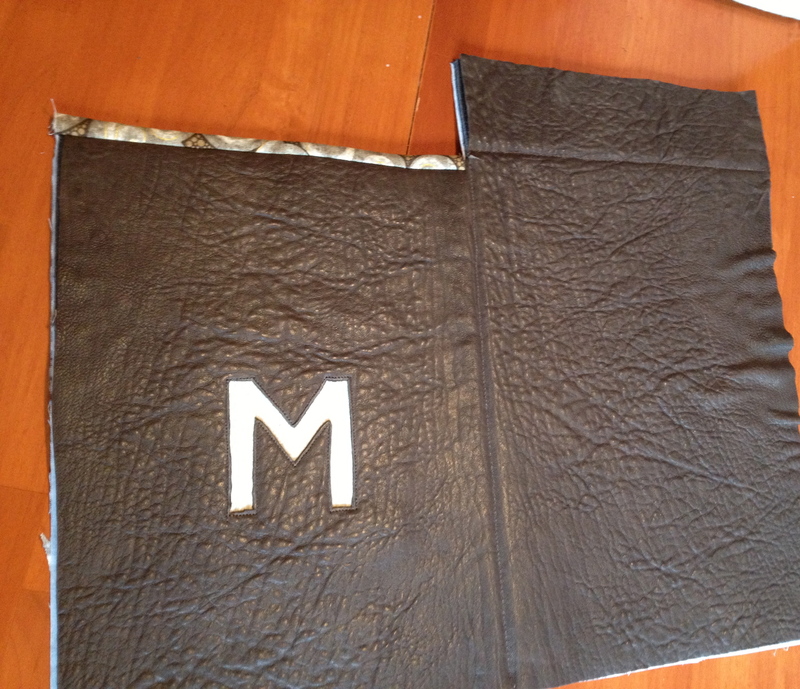 Pockets ready to be sewn in place. 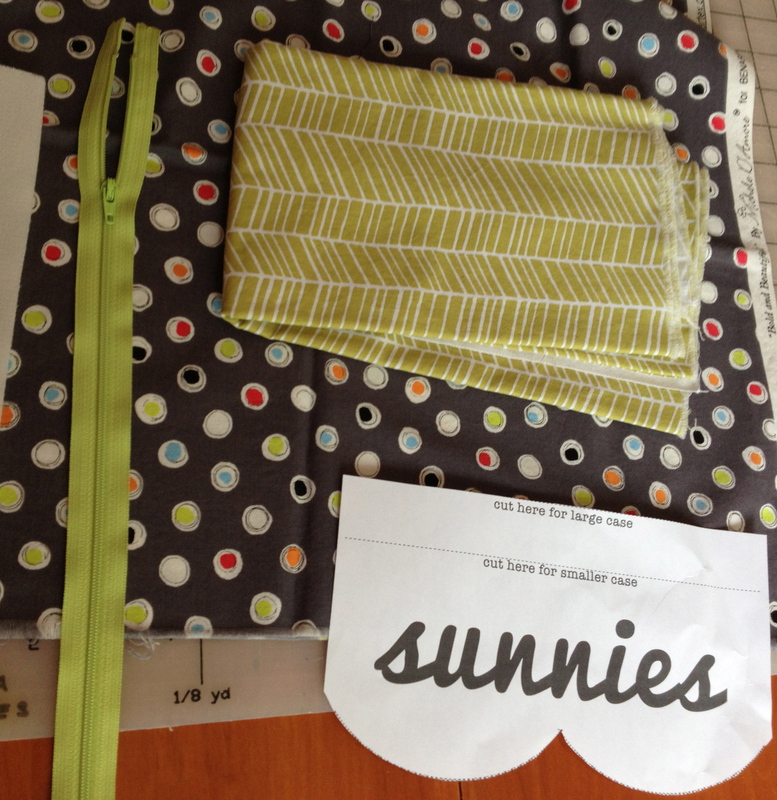 Once the pockets are in place, sewing up this project is just a matter of placing the outside piece and the pocket piece right sides together and sewing around the edge except for a small opening to turn it right side out. 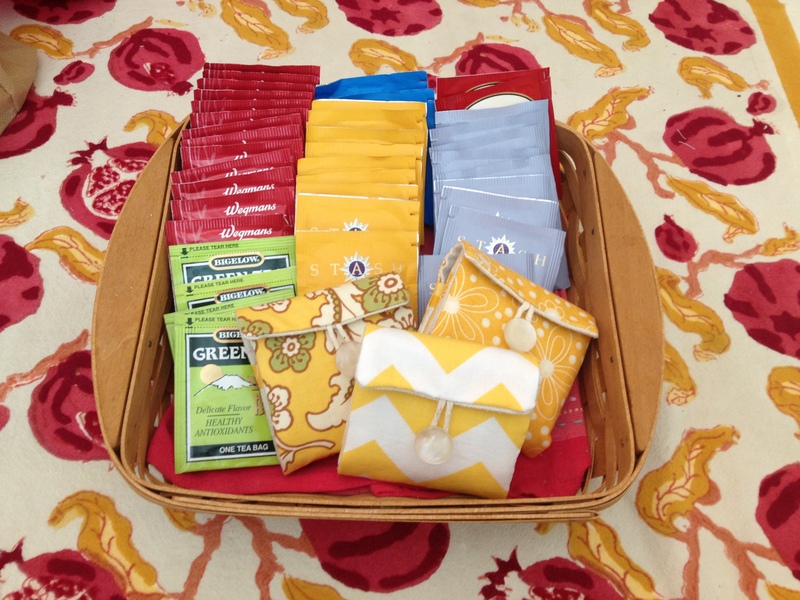 Teabags placed within pockets and pouch folded up. Button sewn in place. Another quick and easy project done. Take a look at the Flickr group here to see what other sewers have done this week. 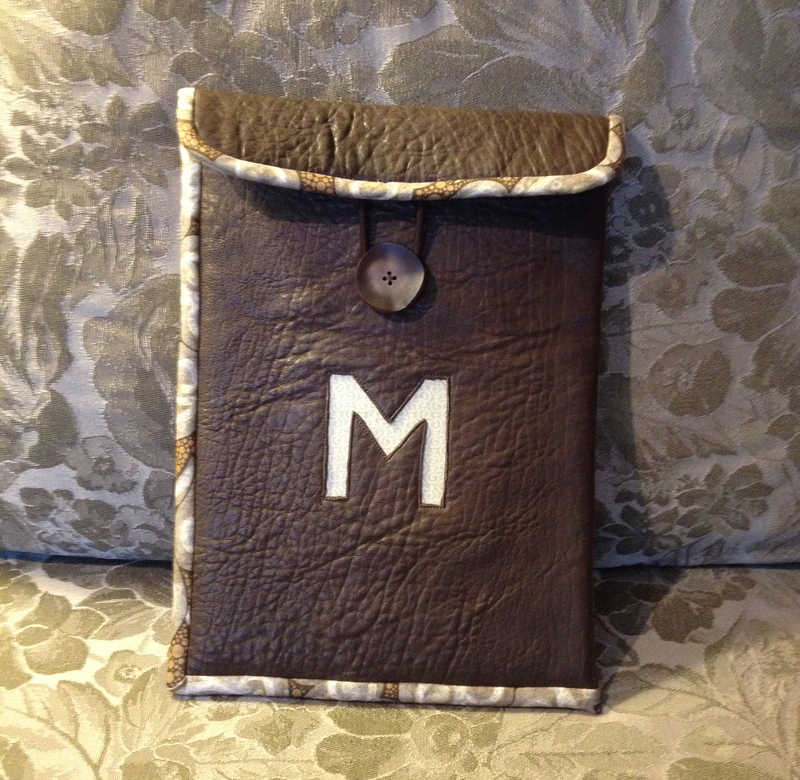 Everyone is doing such a great job of personalizing these projects to fit their own use and style. 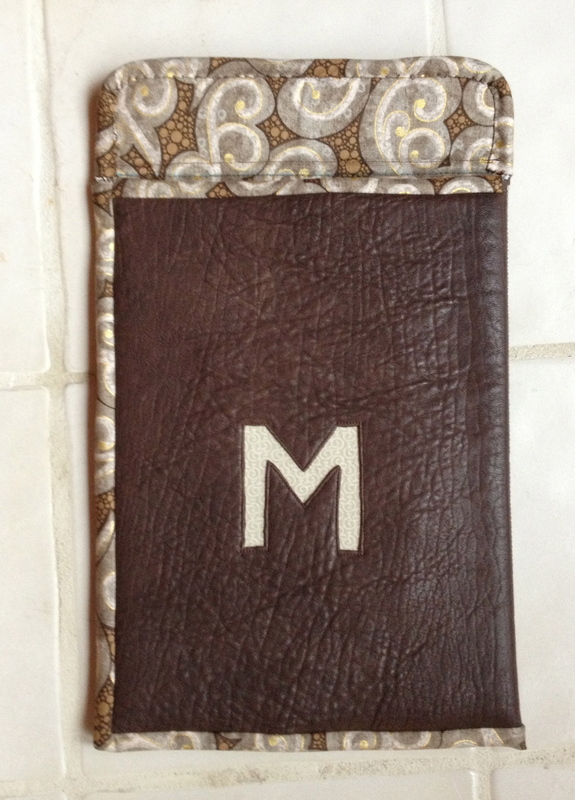 Instead of a tea cozy with the word TEA pieced on it, Lindsey of LR Stitched made a toaster cover with the word EAT on it and . . .
Diane of Random thoughts. . do or “di” made a mixer cover for her Mixmaster. 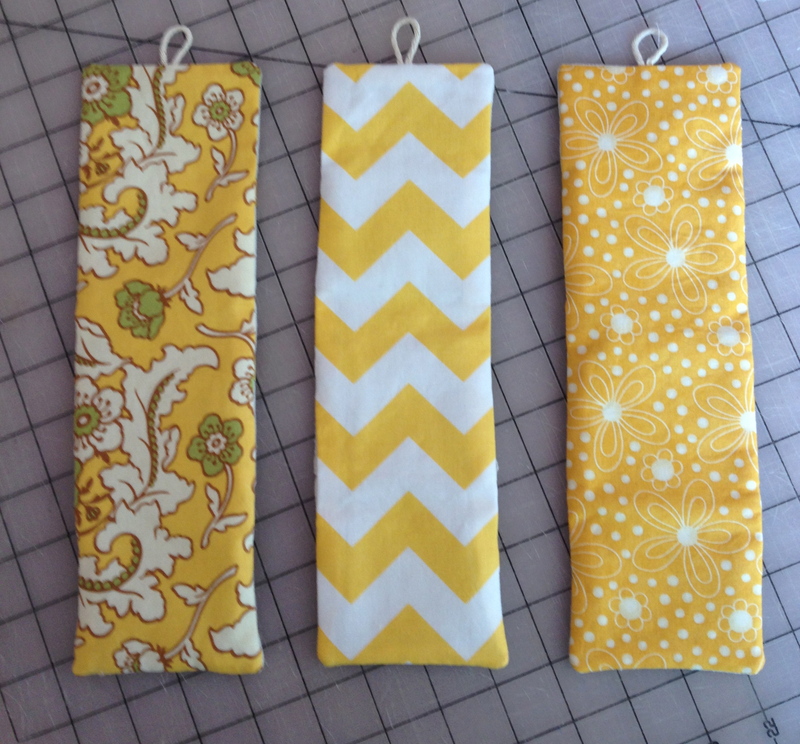 Here is a quick and easy gift to make for summer – a sunglasses case! 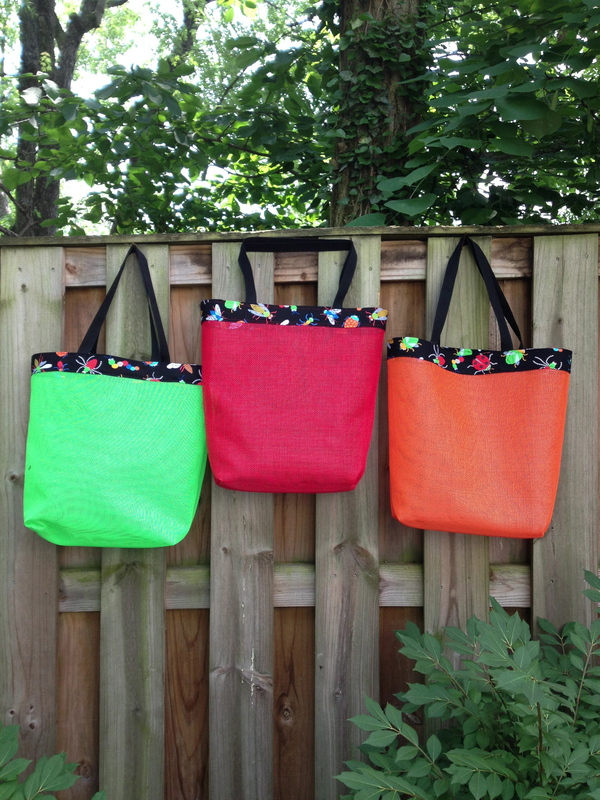 I found the free pattern here at Riley Blake Designs. It was written by Melissa of Polka Dot Chair. 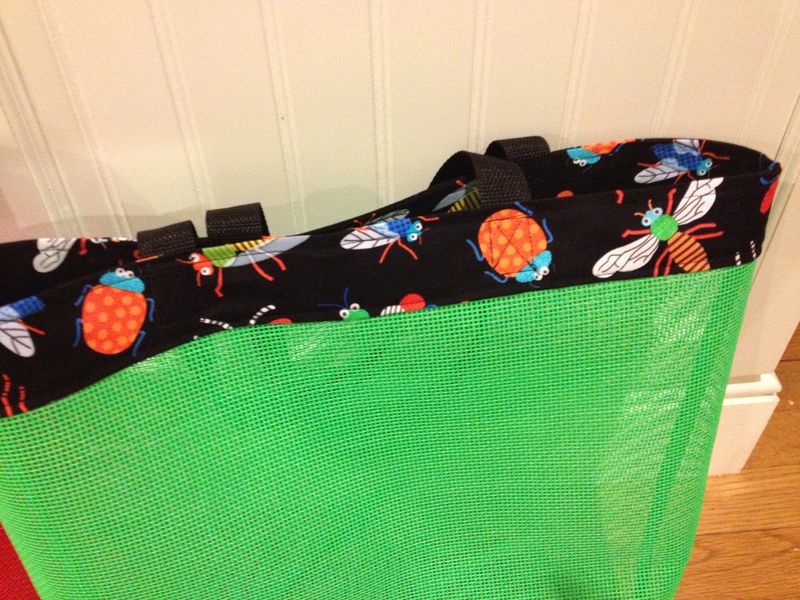 There is a download for the pattern piece (which comes in two sizes). At first I thought I could print it from the “preview” but it wouldn’t size right. Once I actually downloaded it, there was no problem with the sizing. Duh! 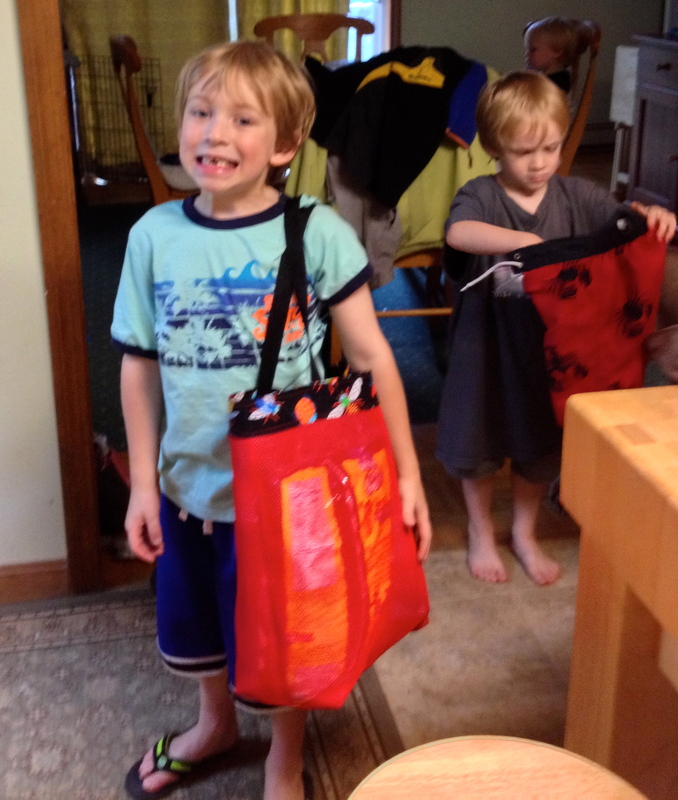 The directions call for a 7″ zipper which I did not have. Mine was 14″. 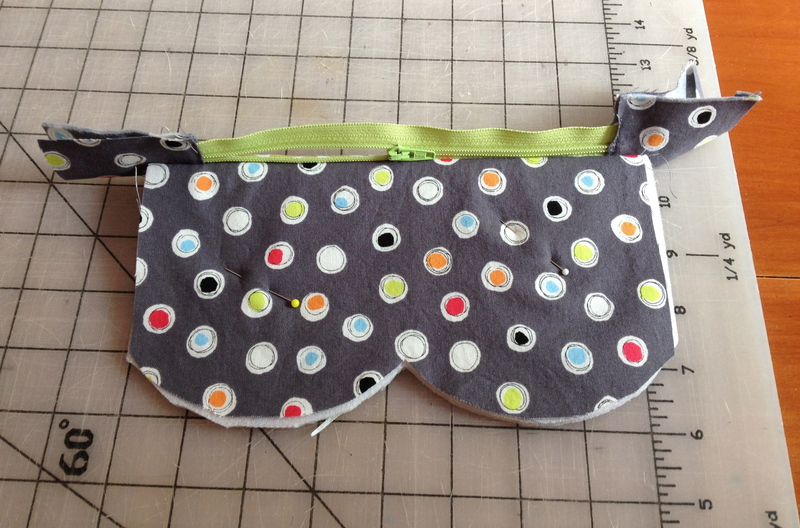 I added a fabric covering to each end of the zipper leaving only 6-1/2″ in between and cut off the excess zipper. Outside piece and foam treated as one piece. 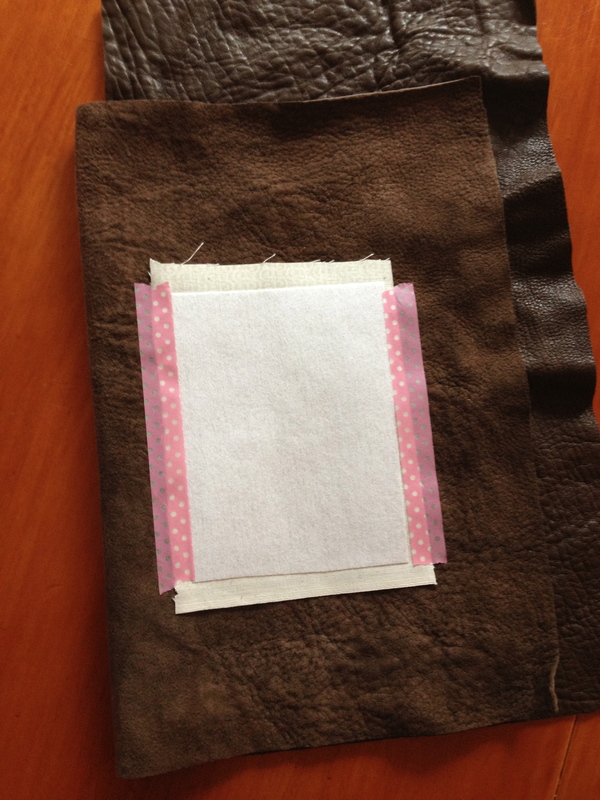 I used ByAnnie’s Soft and Stable for the padding. 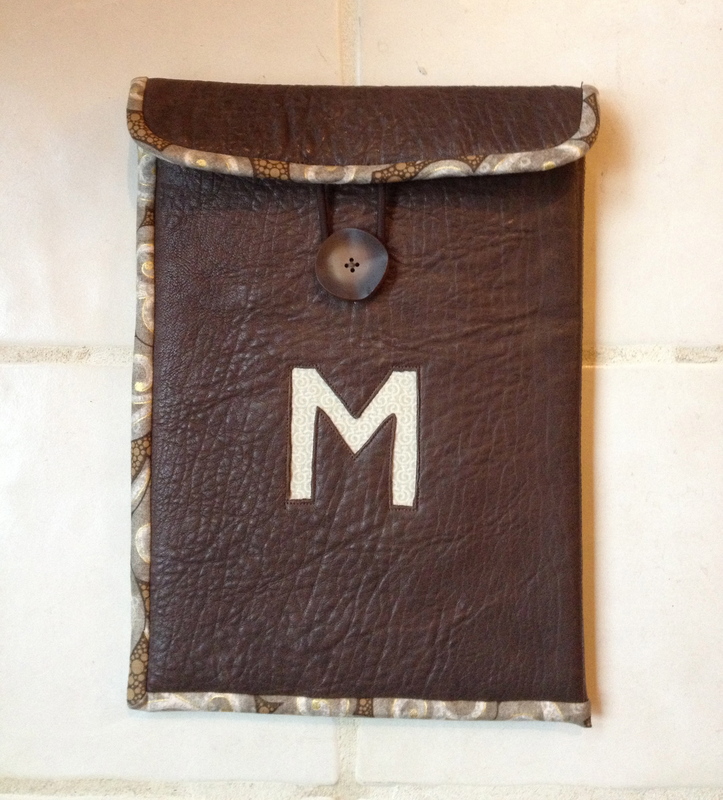 This is a product that I have enjoyed using in a variety of bags I’ve made recently and I had scraps that were big enough for this little project. 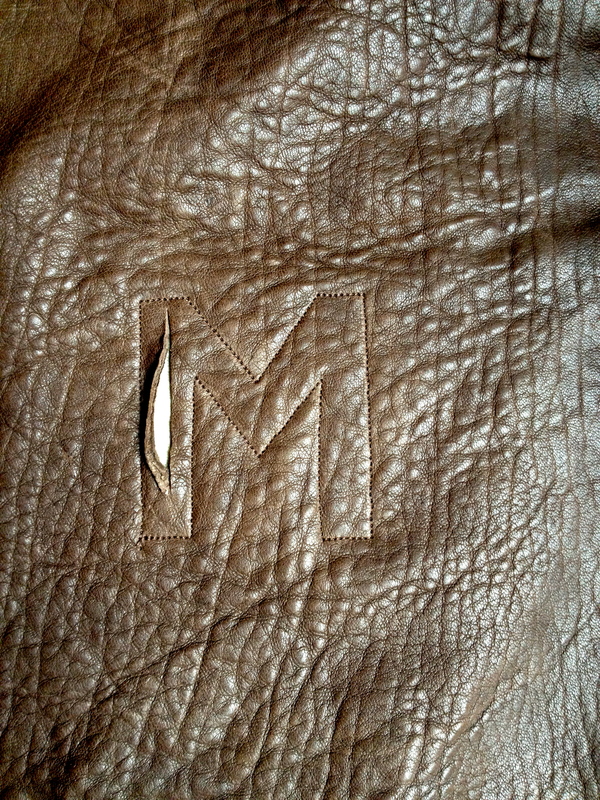 One outside and one lining piece sewn on to one side of zipper. 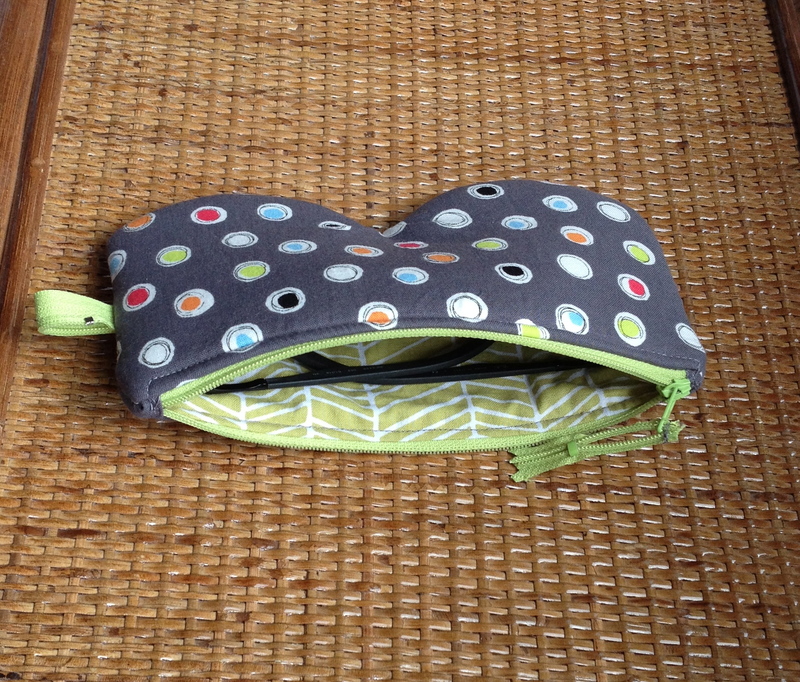 I used the leftover zipper pieces for the zipper pull and a tab coming out of the side that I will put a clip on. 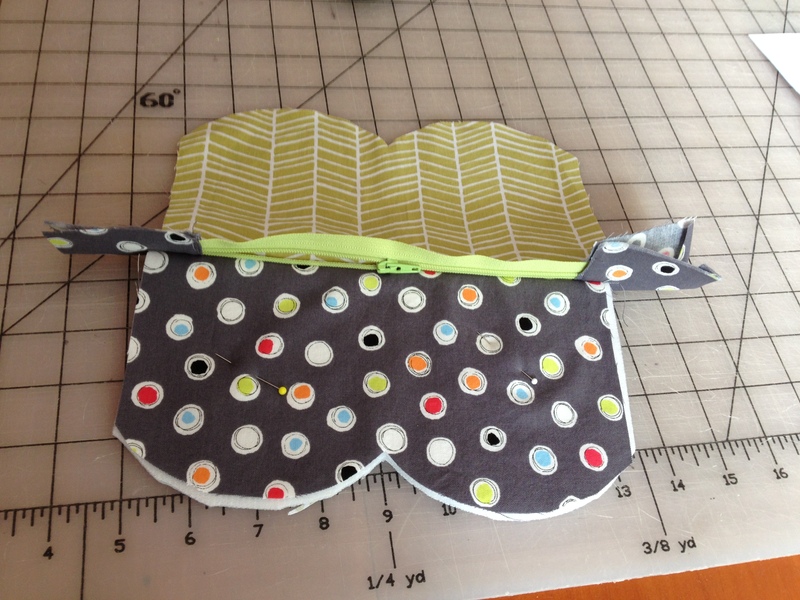 Zipper fun – tab and pull. 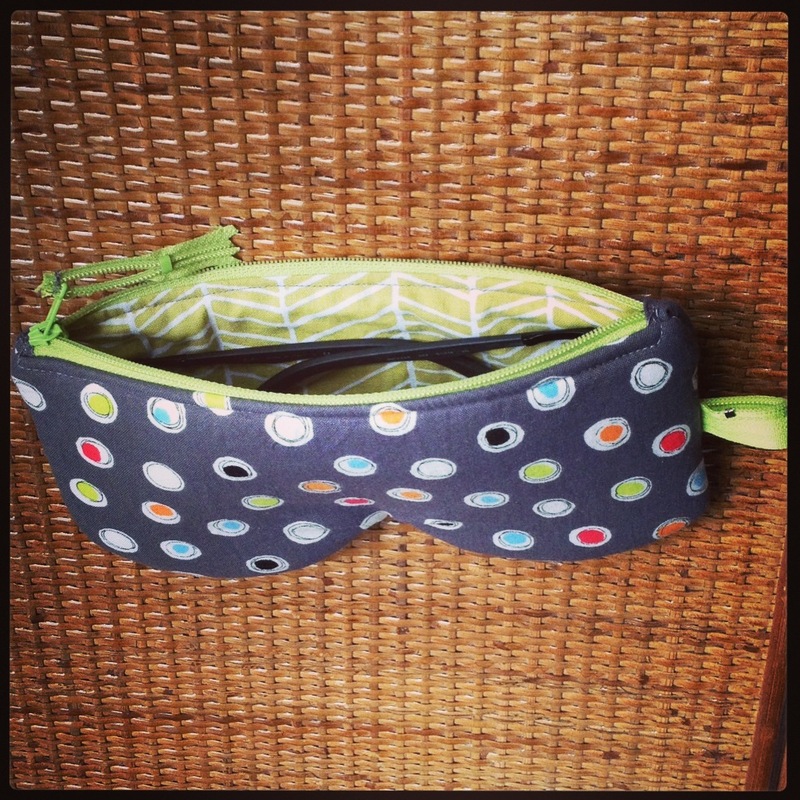 I made the larger size because the niece I’m gifting this to has large sunglasses. I’m pretty sure that most adult sunglasses would fit into this size case – whether the glasses are large or small. Now for some fun in the sun!